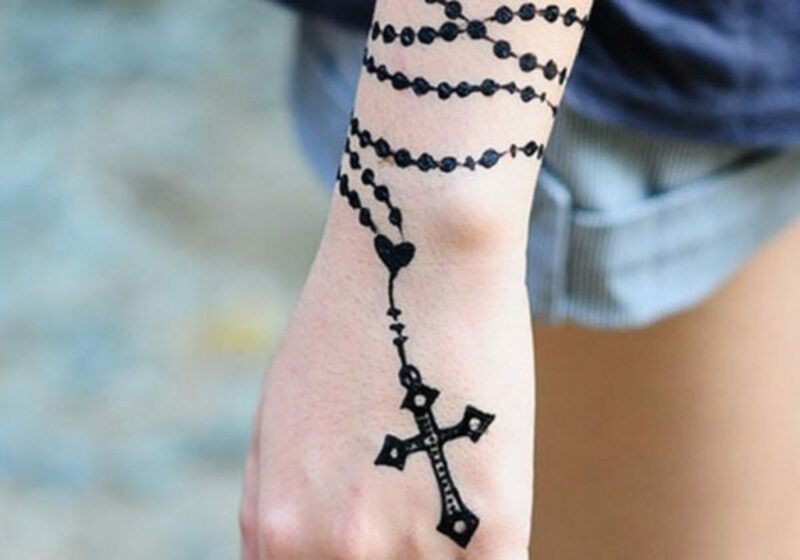 Rosary tattoos are popular with both men and women and are usually very symbolic to those who wear it as body art, though different people choose the design for different reasons. 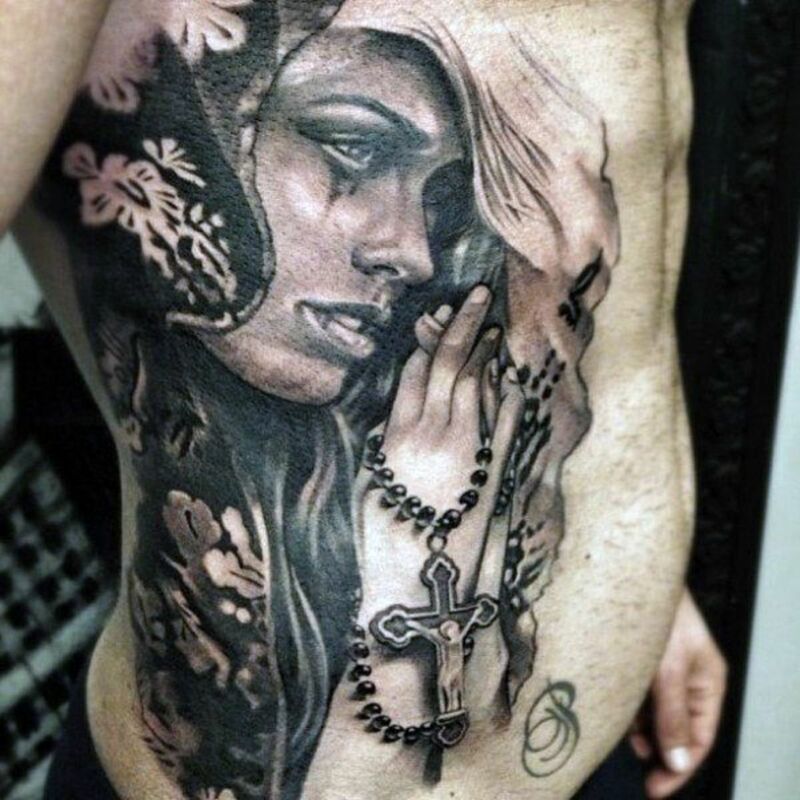 In this article, we will discuss rosary tattoo meanings and look at a wide variety of different designs. 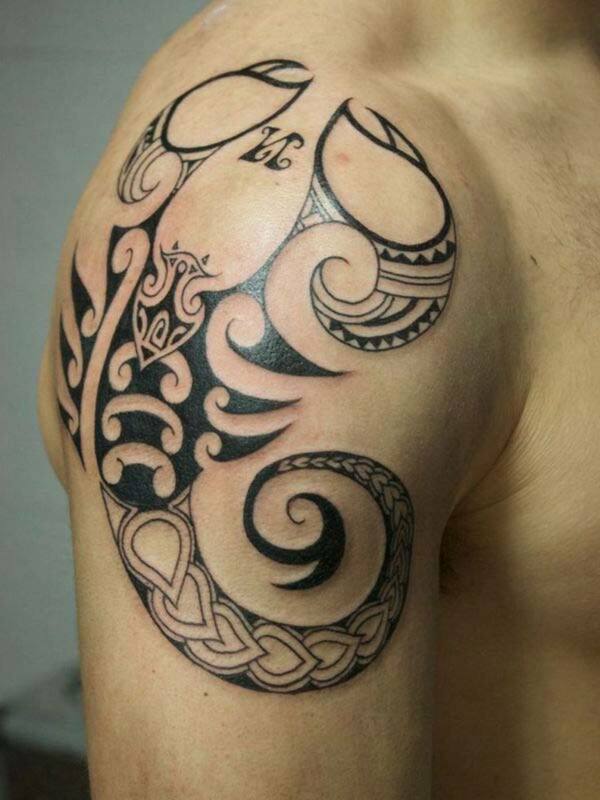 In the end, you will hopefully be able to find inspiration and ideas for your next tattoo venture. What Is a Rosary and What Does It Mean? A rosary is a beaded necklace that is used for prayer in the Roman Catholic Church and is considered a sacred symbol. The traditional rosary is made out of five sets of ten beads (known as a decade) and includes a cross at the end of the chain. The rosary is a basic system that is used to count how many prayers are said. Each bead represents one prayer and each decade is used to meditate on one mystery. The string of beads on the rosary is also called a "chaplet." Although the rosary is usually used for praying, some also use it to keep away demons. Does It Have Anything to Do With Roses? Yes. 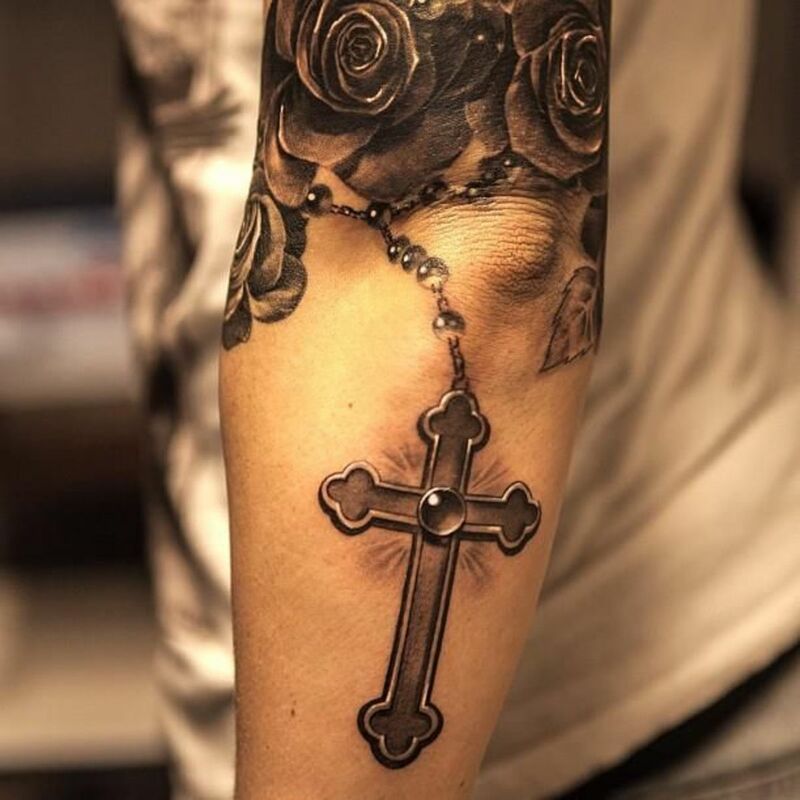 The rosary is commonly associated with the rose for a few different reasons, which is why you will see tattoos that incorporate both. 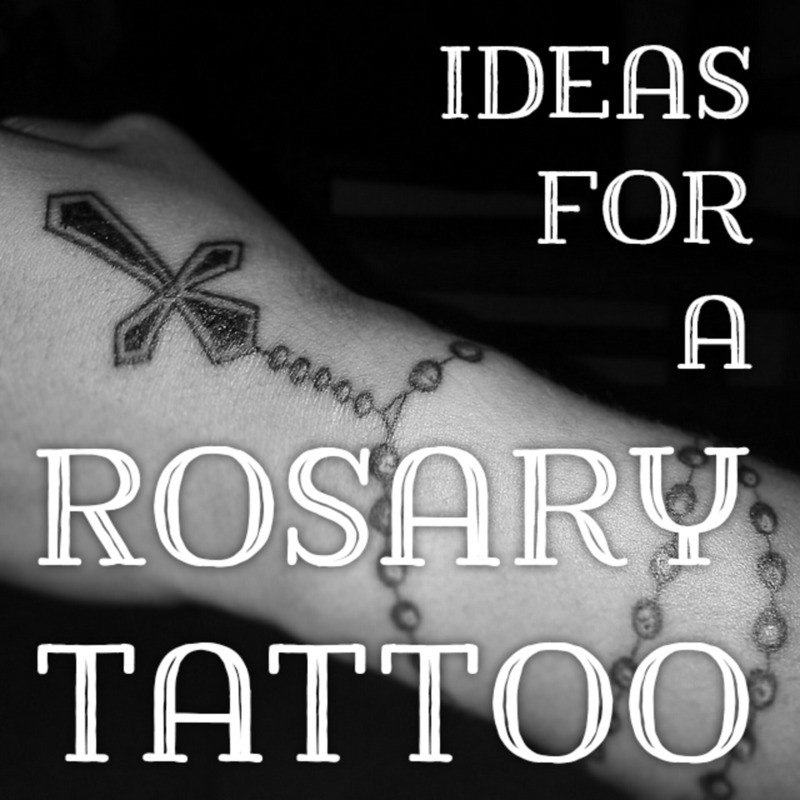 The Latin word for rosary is rosarium, which means "garland of roses." Roses have often been used to symbolize the Virgin Mary, and the rosary is a devotional prayer tool dedicated to Mother Mary. It also sometimes represent Jesus and his crown of thorns. Traditional rosary beads used to be made out of grounded-up rose petals. 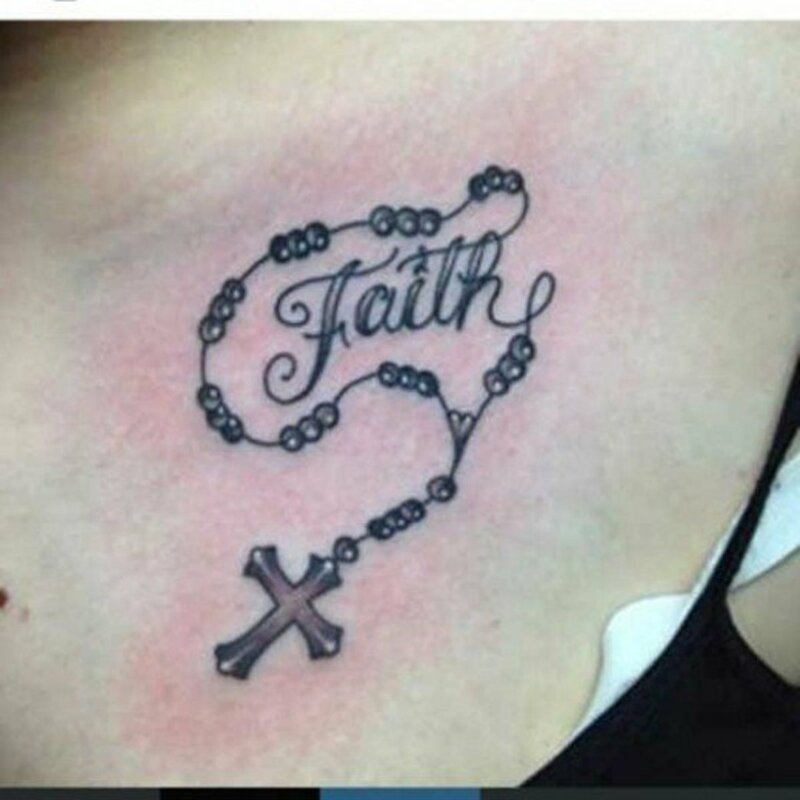 In general, someone who wears a rosary beads tattoo is announcing their Catholic faith, but the tattoo could carry a more subtle and personal meaning for each person. Prayer: This is the most obvious one because the rosary is used to say the "Hail Mary" prayer and to reflect on the life of Jesus and Mary (called mysteries). 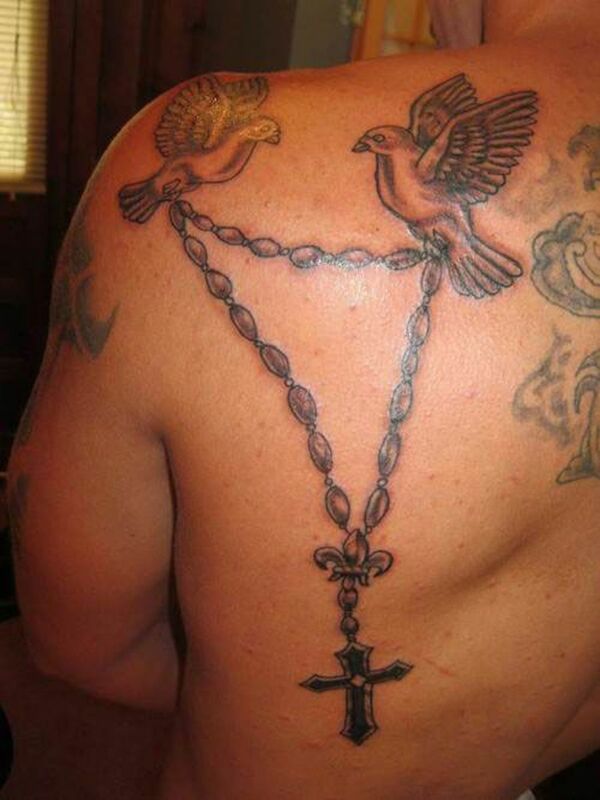 Forgiveness: Saying the rosary is attached to the Catholic sacrament of penance. It is believed that meditating on the life of Mother Mary and Christ through the rosary will wash away one's sins. 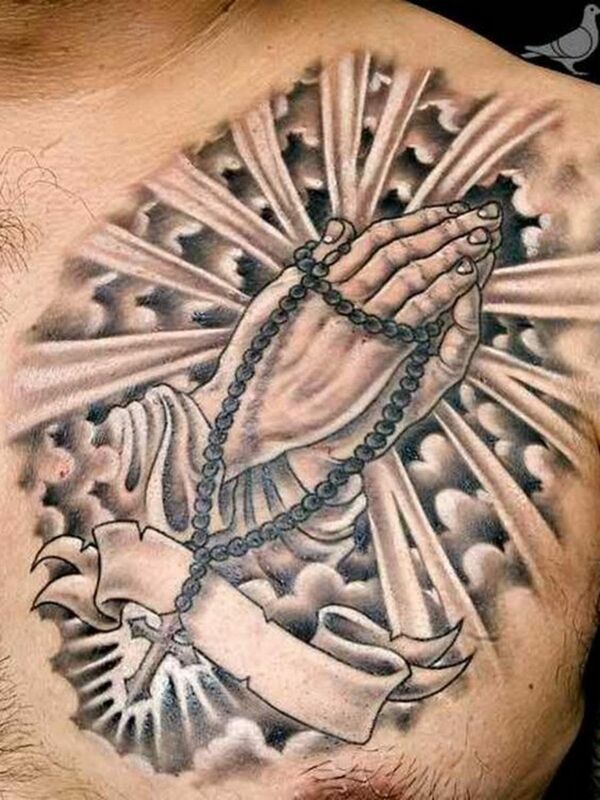 Protection: The rosary is believed to ward of demons and evil spirits as well as steer people away from temptation. 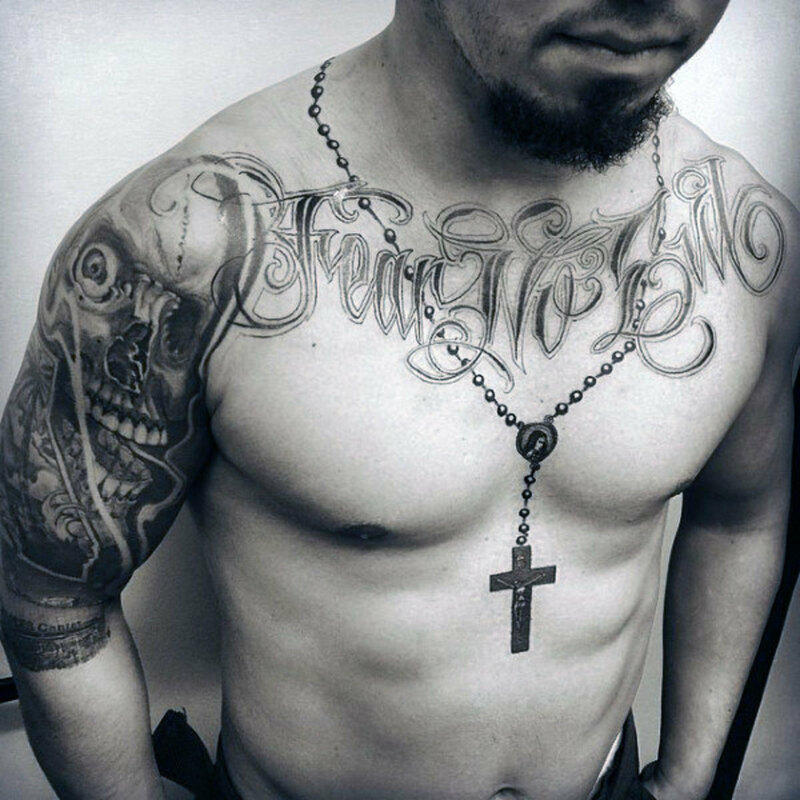 Someone who wears a rosary beads tattoo on their body may do it because they want to feel safe and protected by Mary and Jesus. Mary: The rosary represents the Virgin Mother of God. Catholicism: One of the most prominent differences between Catholicism and other Christian religions is that Catholics honor Mary. 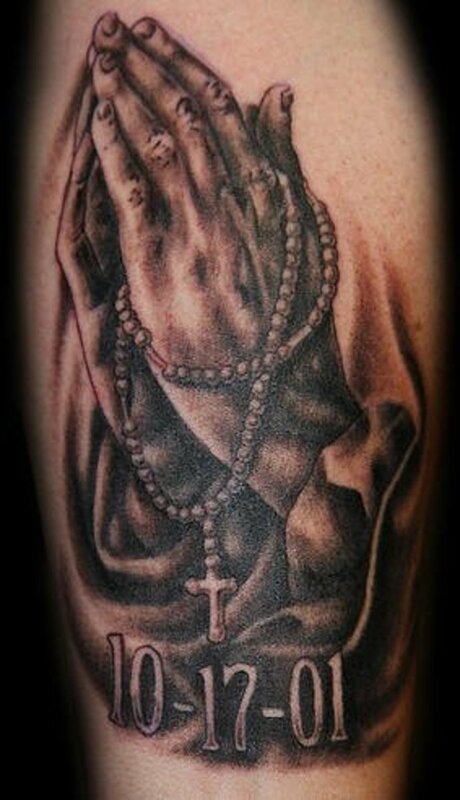 The rosary is a very famous Catholic symbol. 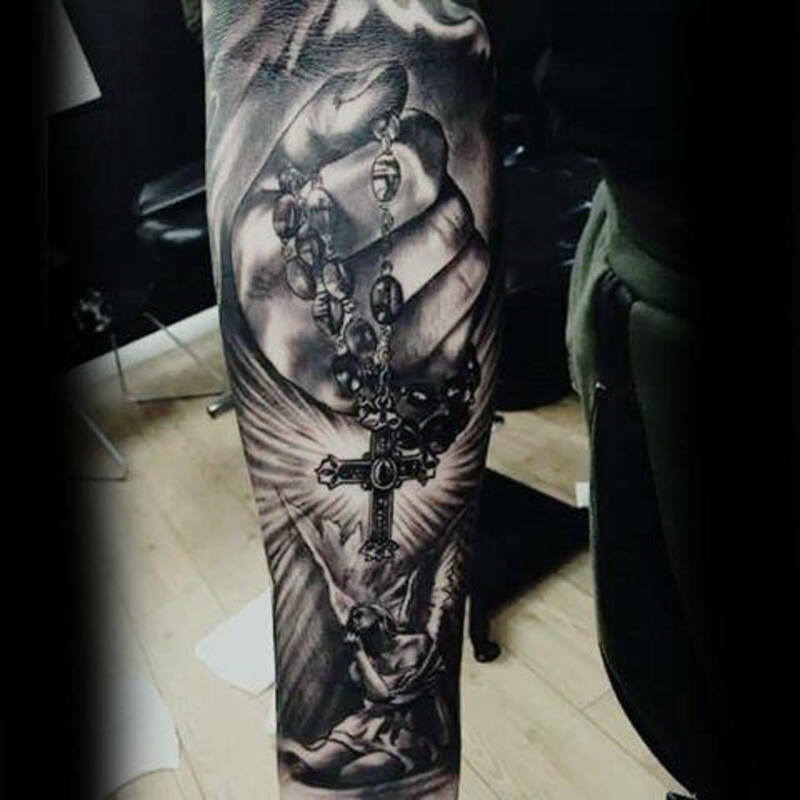 The rosary is a very important and scared symbol to Catholics, therefore a rosary tattoos will not be viewed in the same manner as other Bible-related tattoos, such as an angel or a cross. 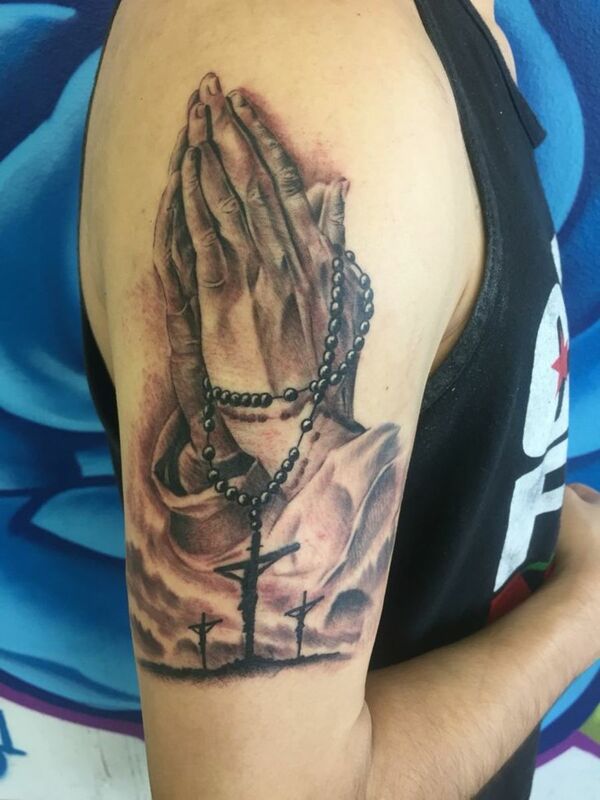 Some Catholics feel that rosary tattoos are a symbol of disrespect and disregard to their religion while other Catholics get it because they want to show how devoted they are to the faith. 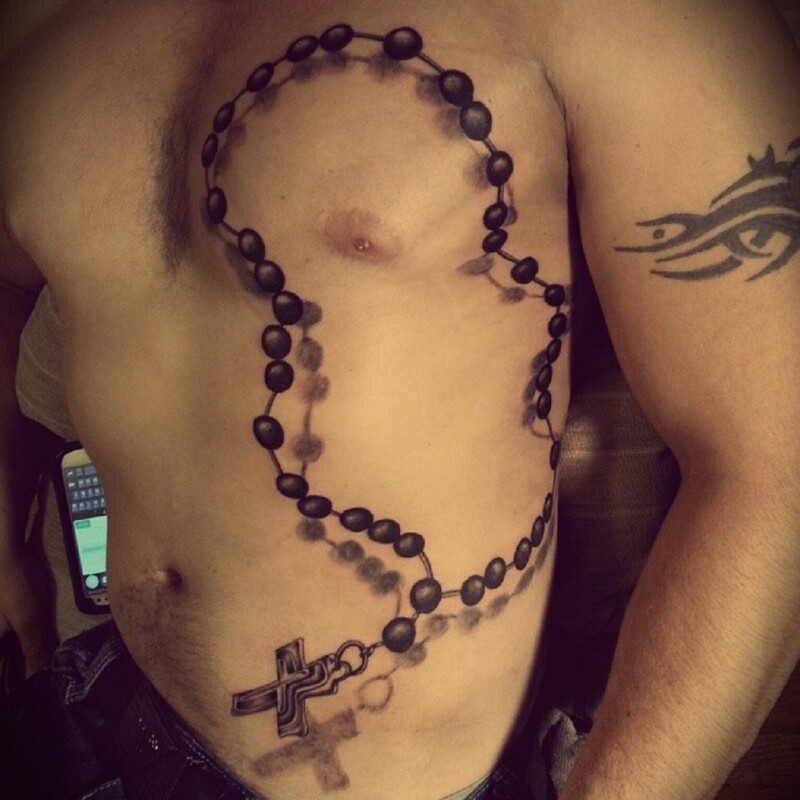 This is not to deter you from your rosary bead tattoo in any way. It is just worth noting. 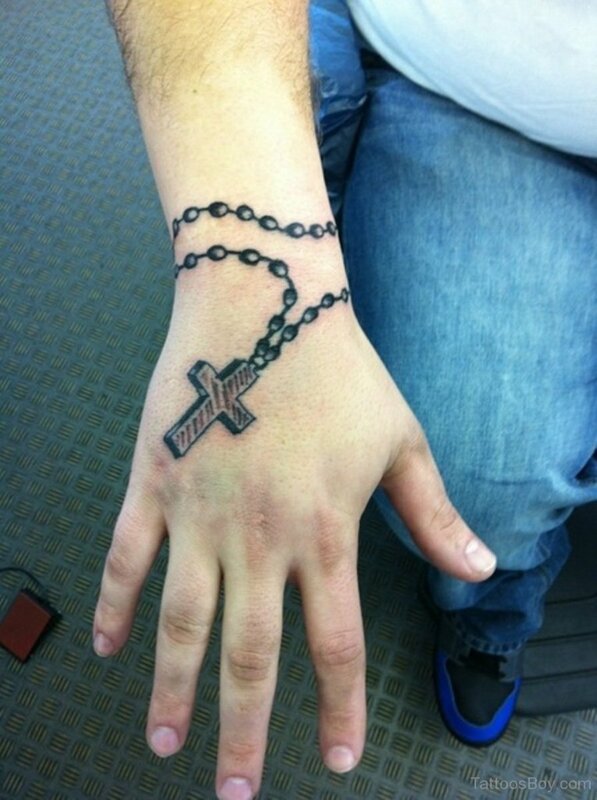 Hands and Rosary Beads: A common design is one with folded hands or praying hands holding the rosary with the beads wrapped around the hands or falling between the fingers. 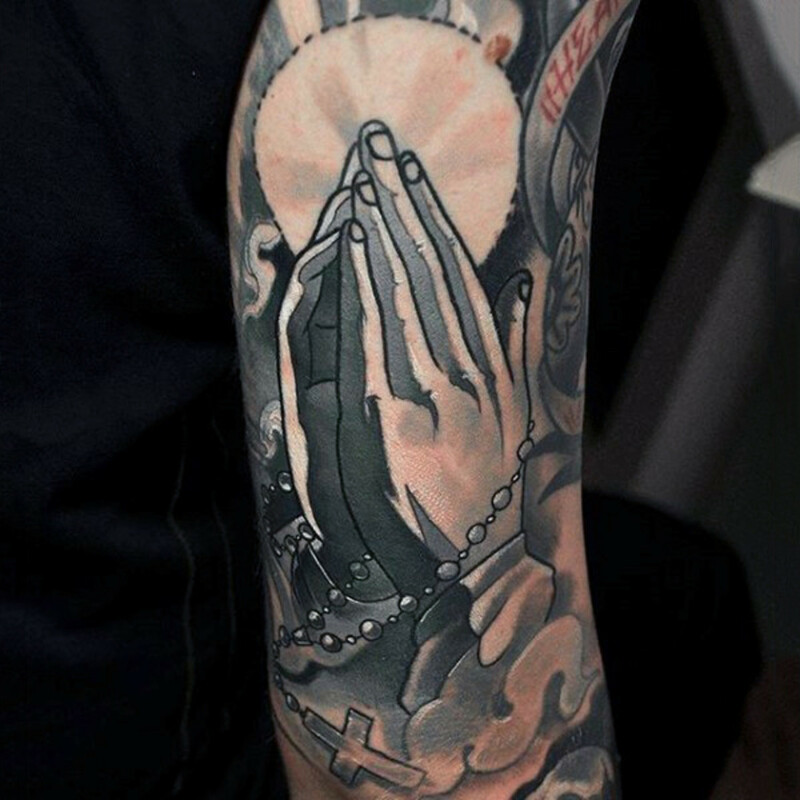 This tattoo can symbolize prayer, meditation, and deep spirituality. 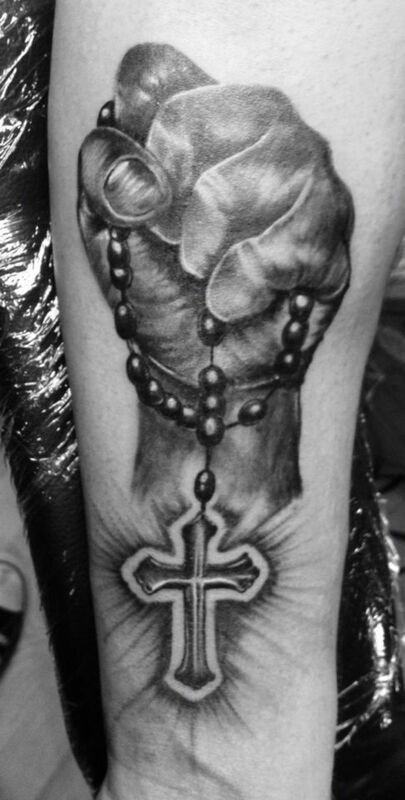 If the rosary is wrapped around the hand, then it represents the wearer's bond to a higher power. 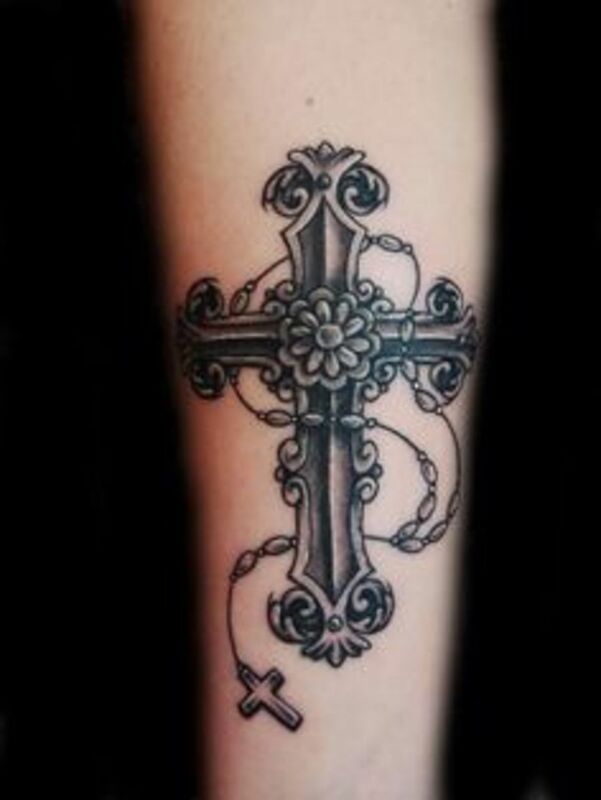 Cross and Rosary: The cross is a common Christian tattoo that represents Christ, who is the central figure of Christianity. The rosary represents the Virgin Mary, who is an important maternal figure in the Catholic faith. 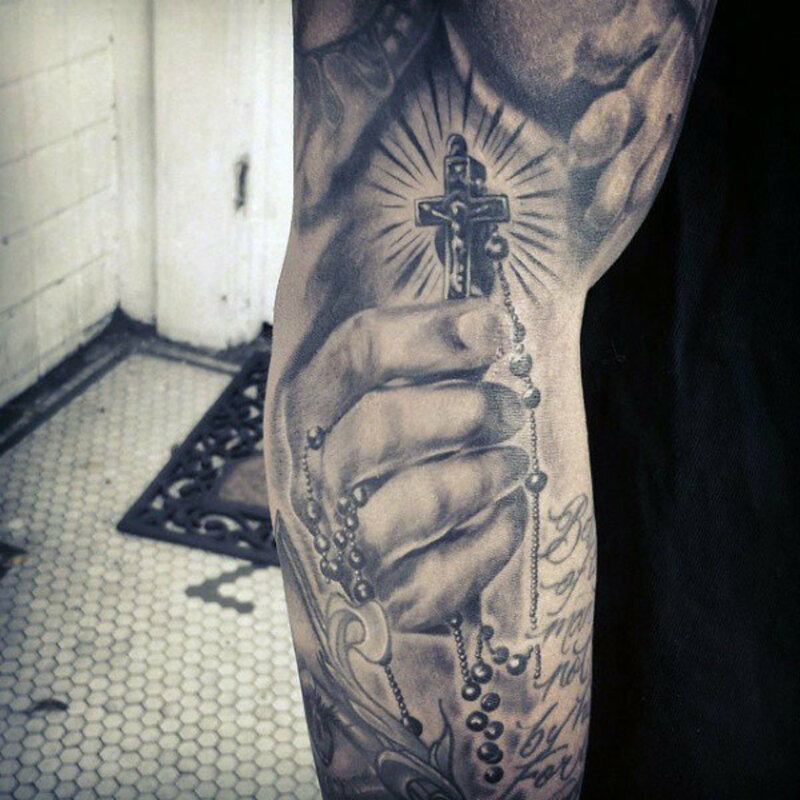 Together, a cross and rosary tattoo symbolizes that the wearer is a Christian, but also, more specifically, that he/she is a Catholic. 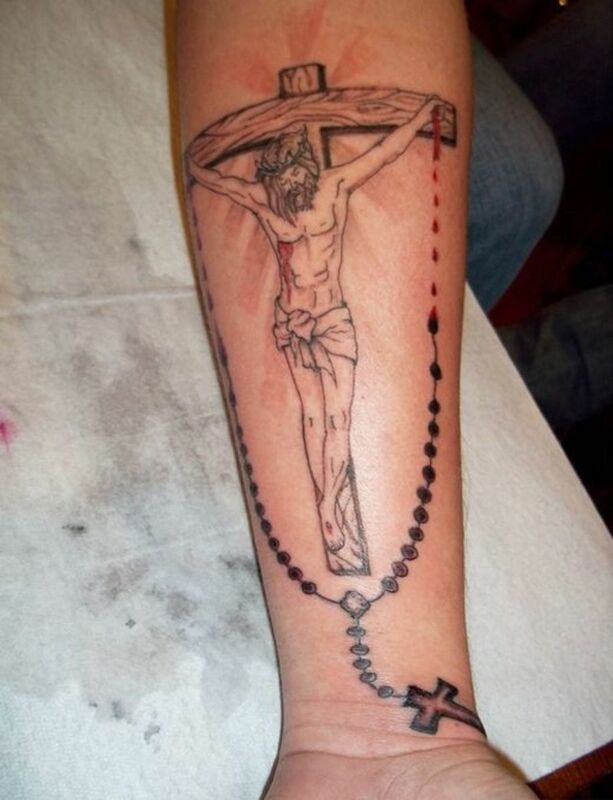 Although the cross is already a part of the rosary itself, many people like to incorporate a bigger crucifix with the rosary wrapped around it. 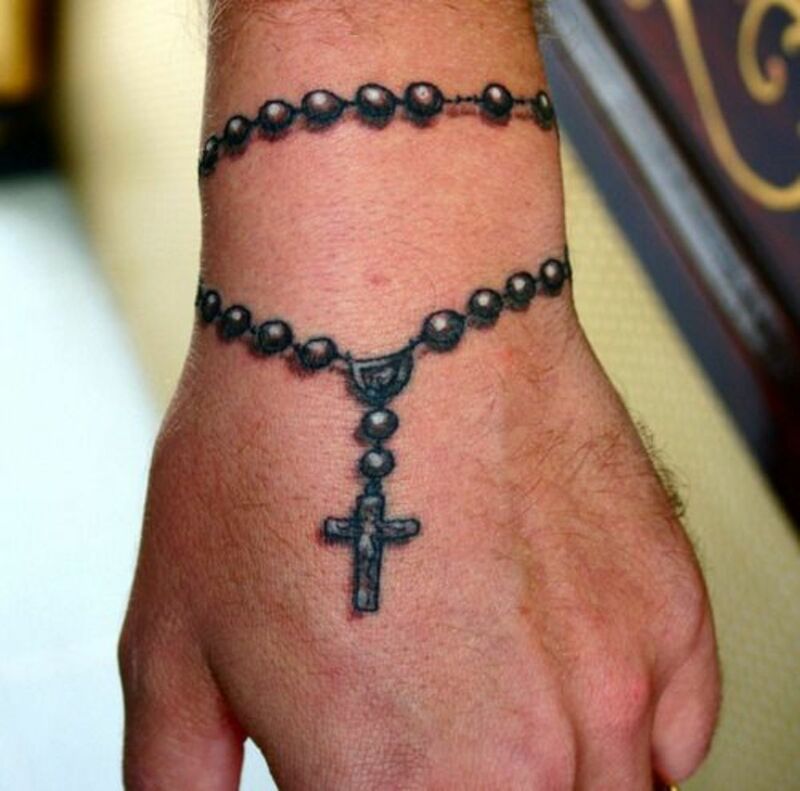 Single Decade Rosary Beads Tattoo: A traditional rosary has 50 beads—10 beads for each decade. Some people carry around single decade rosaries as well, which means there are only 10 beads with a crucifix. These are usually worn as a bracelet so that the wearer can conveniently pray whenever they need to. If the 5-decade rosary is too extravagant, a single-decade rosary is an equally powerful symbol while also being simple and elegant. 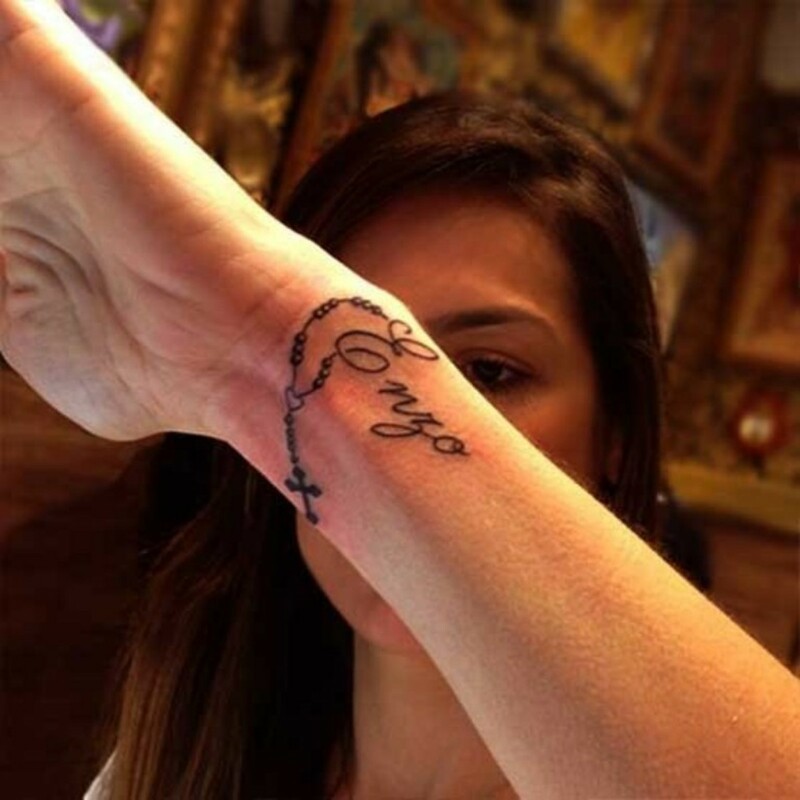 Rosary Tattoo With Name: Getting your name or a loved one's name along with a rosary is a way of saying that Mary is always protecting and guiding that person. 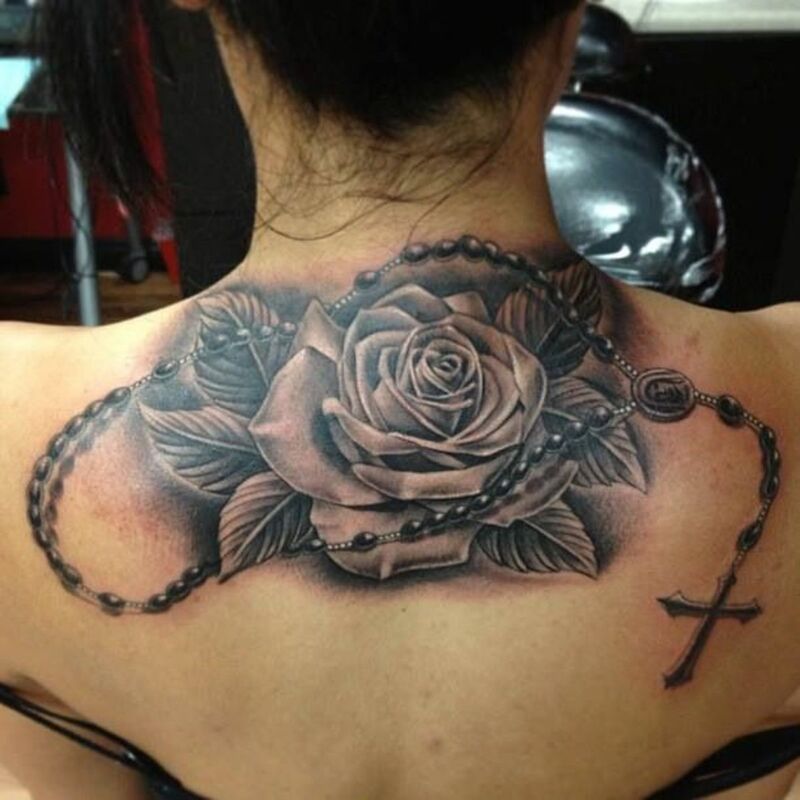 Rose and Rosary: In Latin, the word rosary means "rose garden," and the rosary used to be made out of dry roses. The association of the two symbols is historic, but it can also carry other meanings. A red rose symbolizes love. 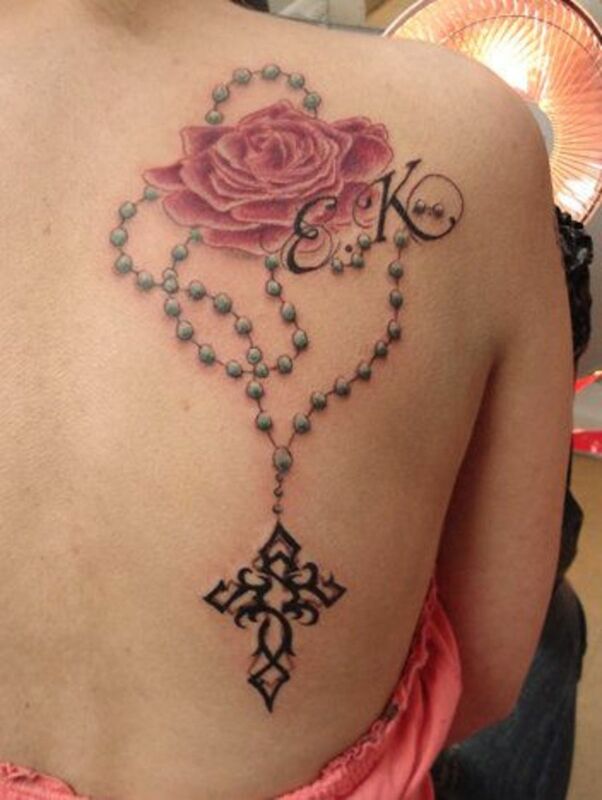 Together, a rose and a rosary represents love and devotion. 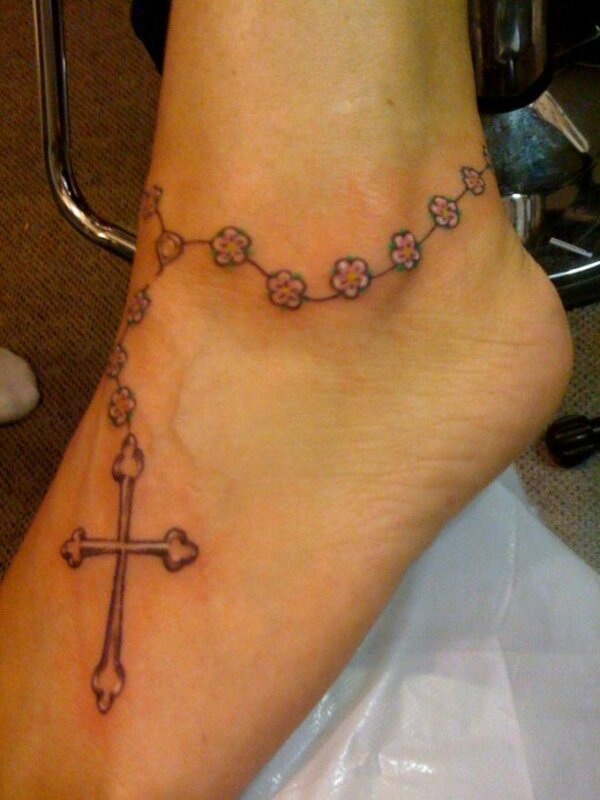 Rosary Necklace Tattoo: Because the rosary is a necklace, wearing one around your neck is traditional. 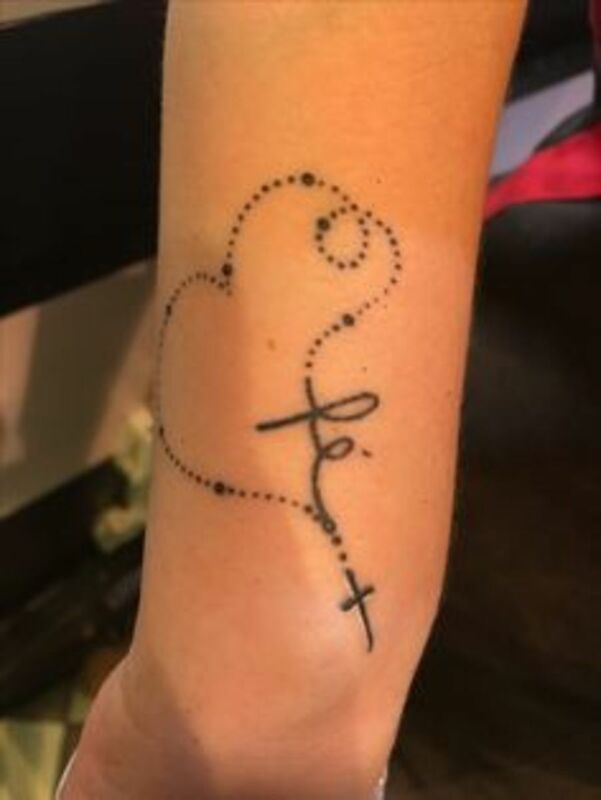 Getting a rosary necklace tattoo symbolizes that you are carrying God and Mary's grace and mercy with you everywhere you go. 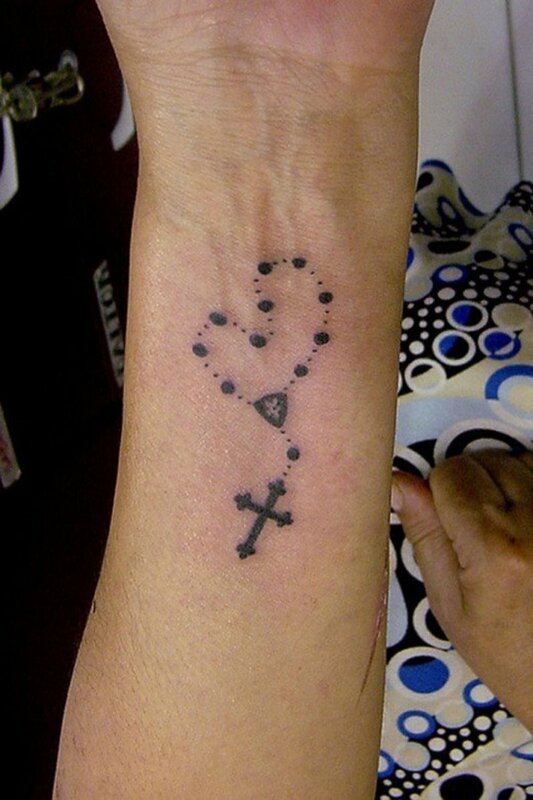 And, because the rosary beads dangle on your chest, the tattoo could also represent how close Mary is to your heart. 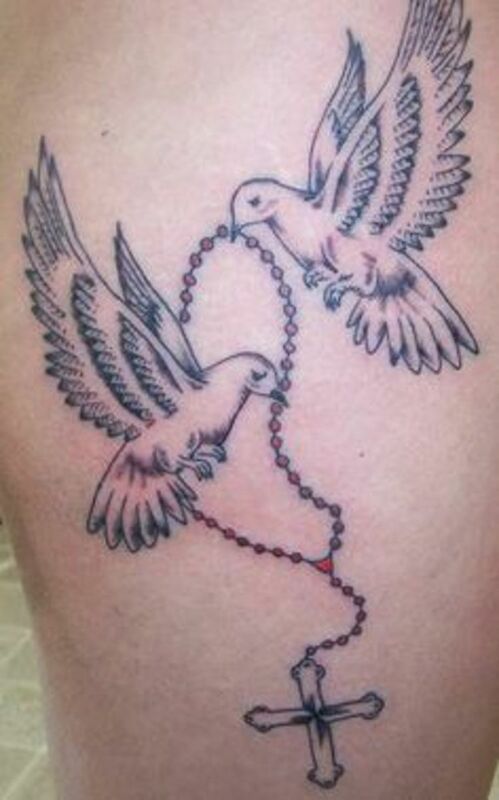 Dove and Rosary: A dove represents the Holy Spirit. In Christianity, the Holy Spirit is a strong guiding force that leads people away from sin and on to the path of righteousness. The rosary also erases sin. 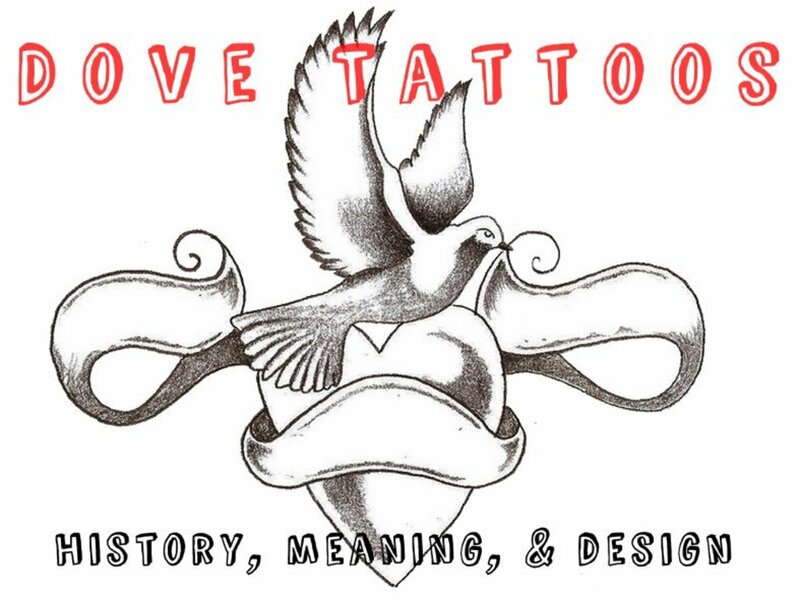 So if you get a flying dove and a rosary, then the tattoo represents freedom from sin and evil. Rosary and Mary: According to Catholic history, the Virgin appeared to Saint Dominic in an apparition in 1214 and asked St. Dominic to devote himself to the rosary in her name. 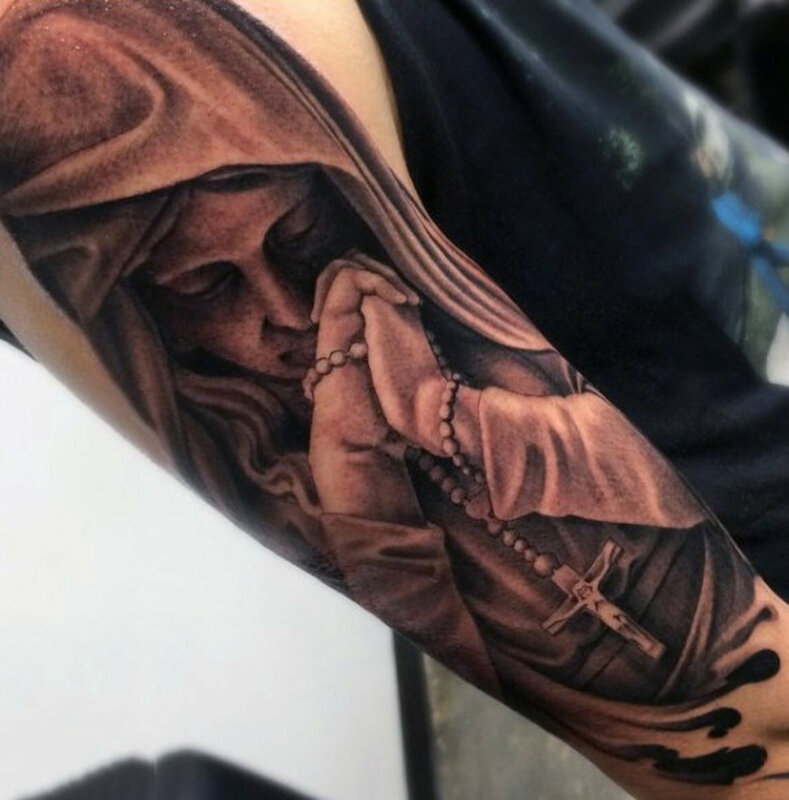 Getting a rosary and Mary etched on your skin in permanent ink is a symbol of strong loyalty to Christ's mother. 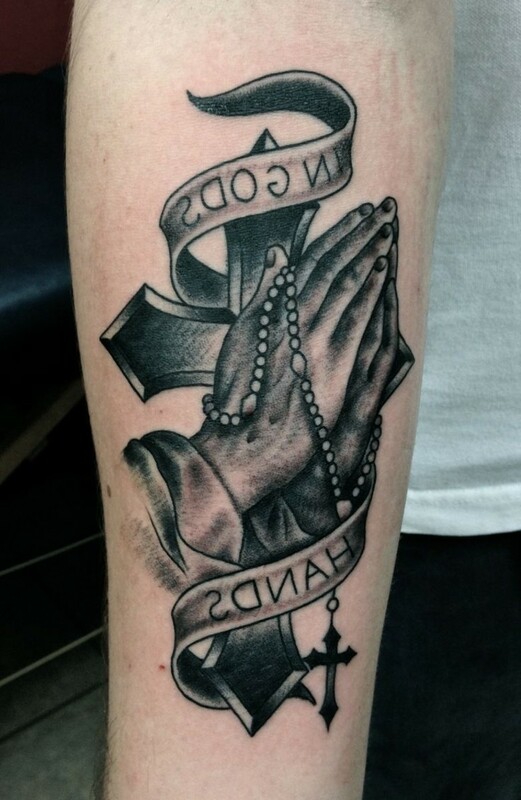 Rosary With Hail Mary: This is a really awesome way to have the very words uttered by Angel Gabriel displayed on your body. In the Bible, when Angel Gabriel appeared to Mary to announce that she was carrying God's son, he said, "Mary, full of grace, the Lord is with thee." The prayer is a reminder that, like Mary, the wearer is also in God's grace. 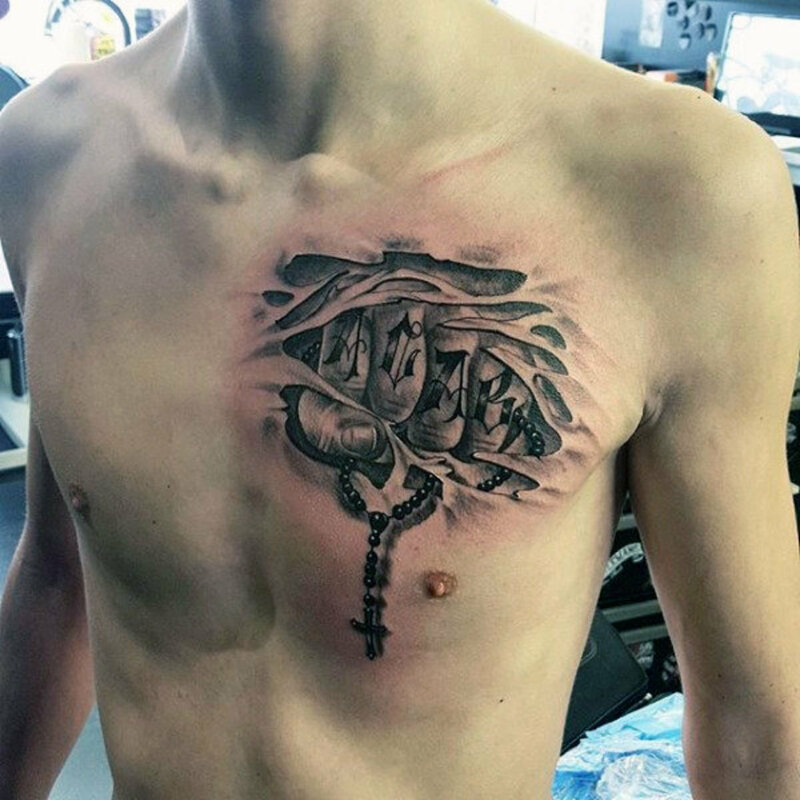 Rosary Memorial Tattoo: Angels, hearts, and wings and usually designs that are added to rosary memorial tattoos to dedicate to loved ones who we have lost. 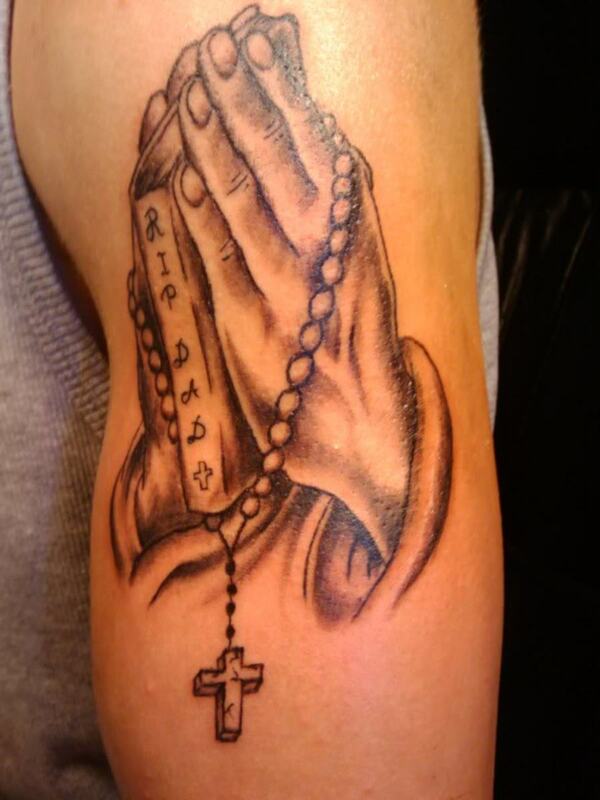 Sometimes the word R.I.P and/or the person's name is incorporated. 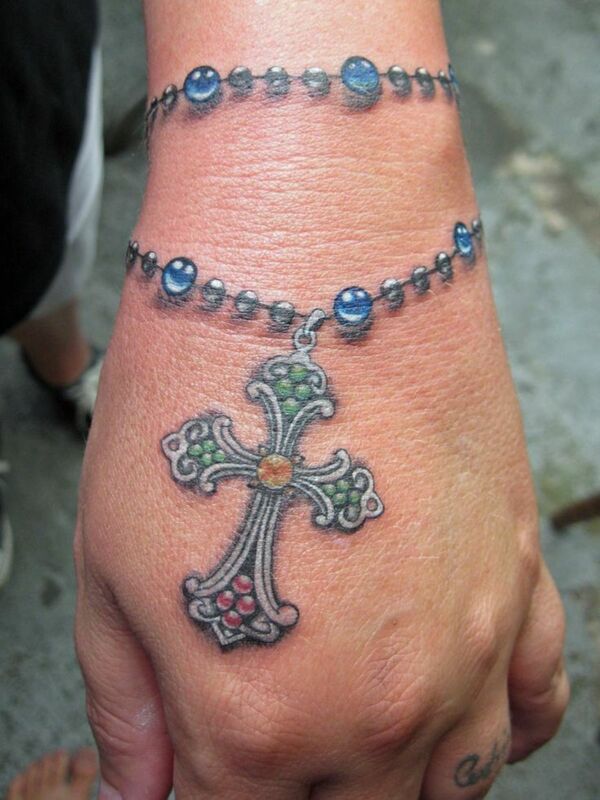 Rosary and Bible: Incorporating other Christian symbols is another great idea. 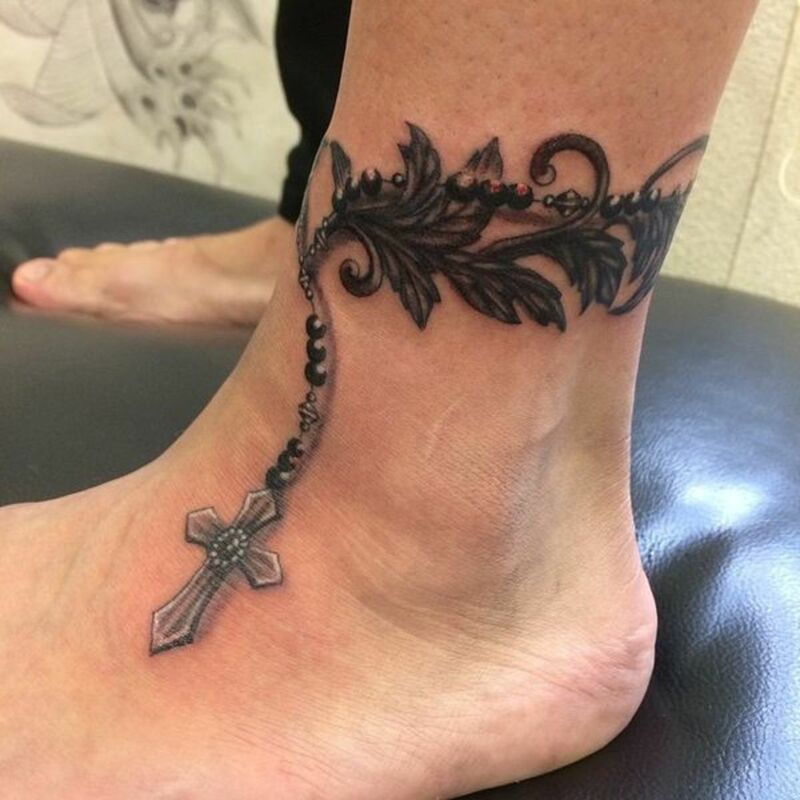 You can ink a bible next to your rosary or include a bible verse that you like. 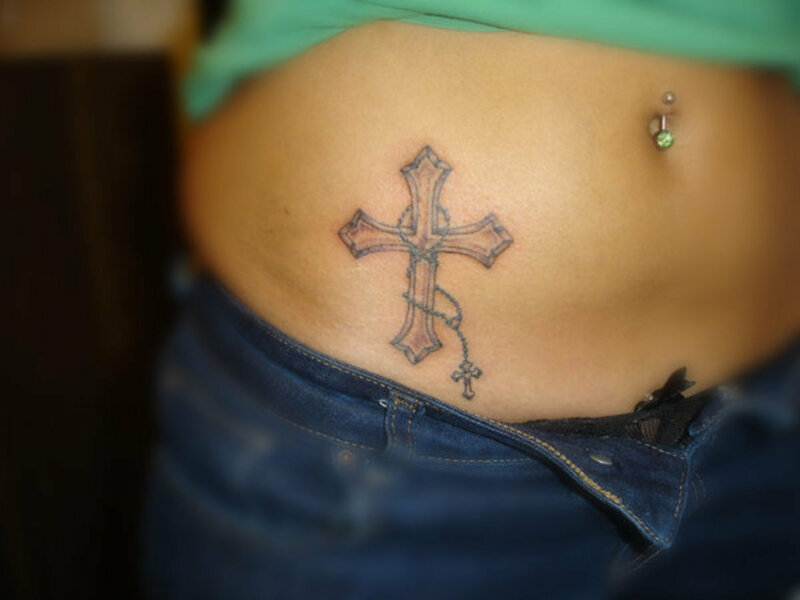 Most people like to include the cross. 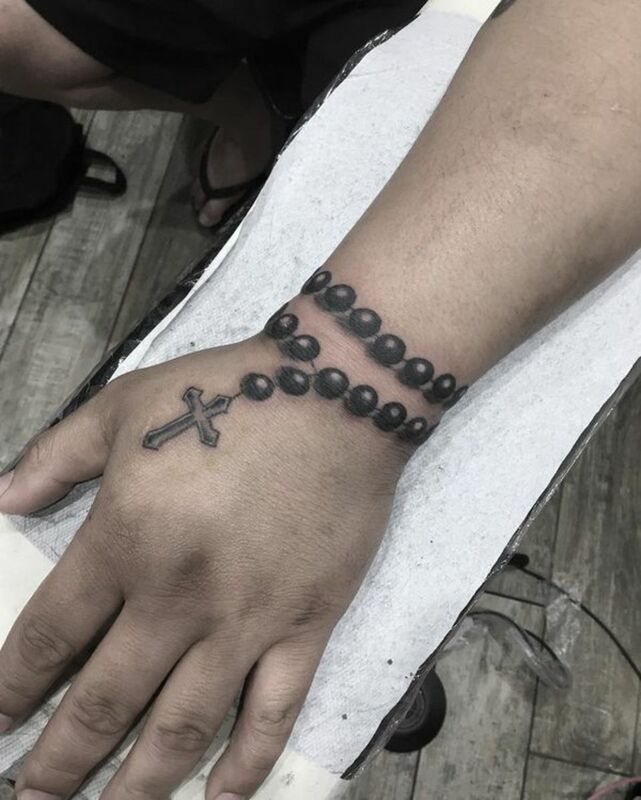 Rosaries can be tattooed nearly anywhere on the body, but you will commonly see them inked around the neck or on ankles, legs, wrist, and arms. Men usually wear them around the neck, mimicking the way it is traditionally worn. 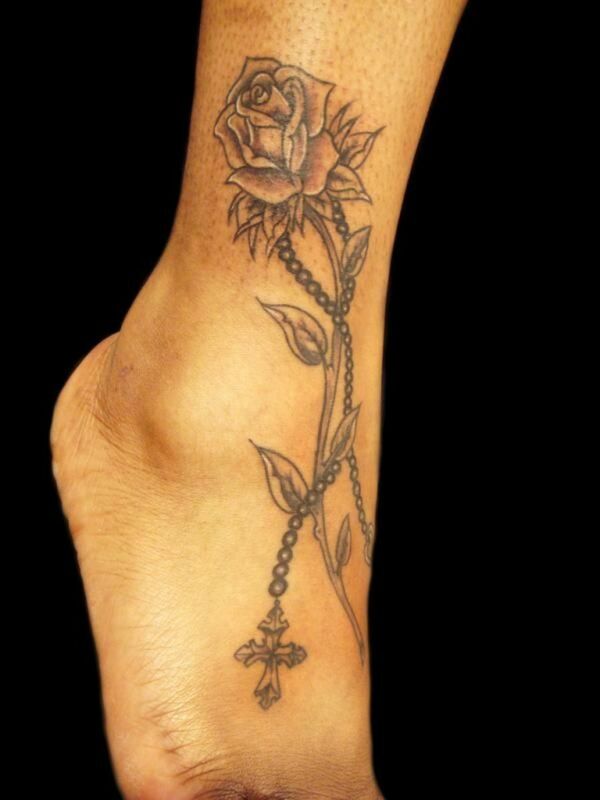 Women often sport theirs around the ankles, though, again, they can be placed in any location. 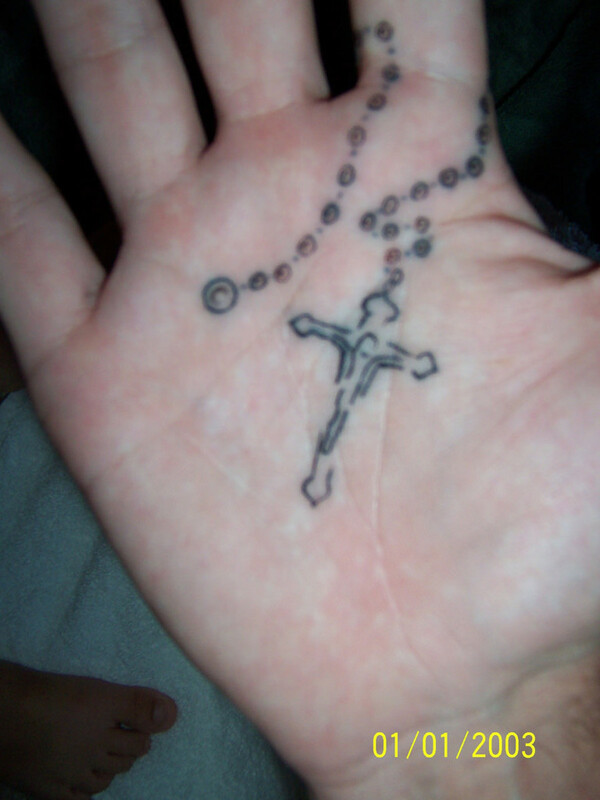 Hand: A rosary beads tattoo on the hand is prominent and expresses your constant devotion to prayer. It may also be symbol of comfort, as if Mary was holding your hand through your darkest hours and in every moment of your life. 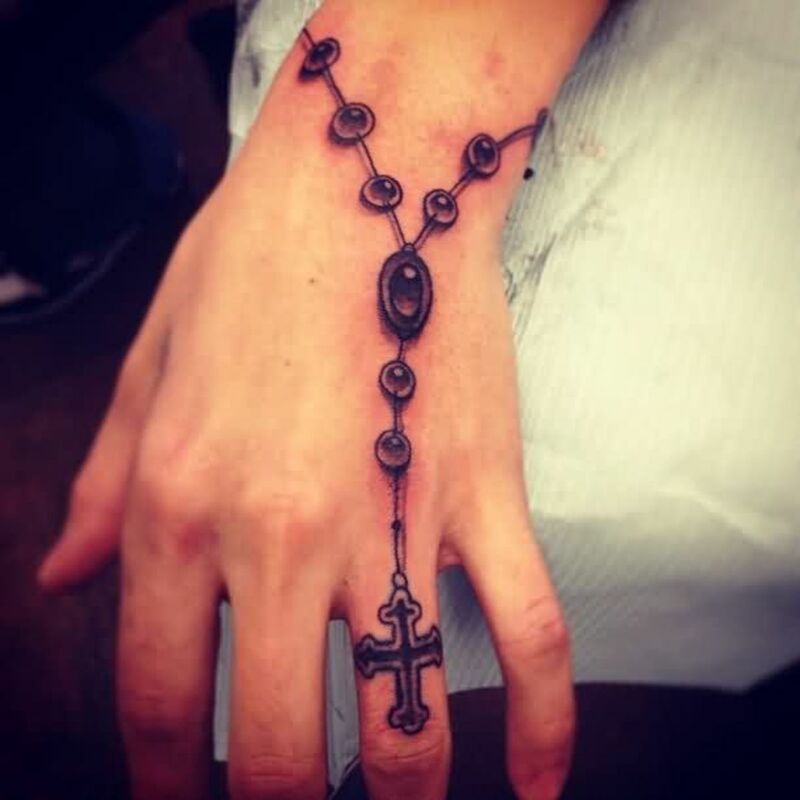 Most people like having the rosary wrapped around their hand and the cross placed on a finger, but I've seen some rosary tattoos on the palm as well. 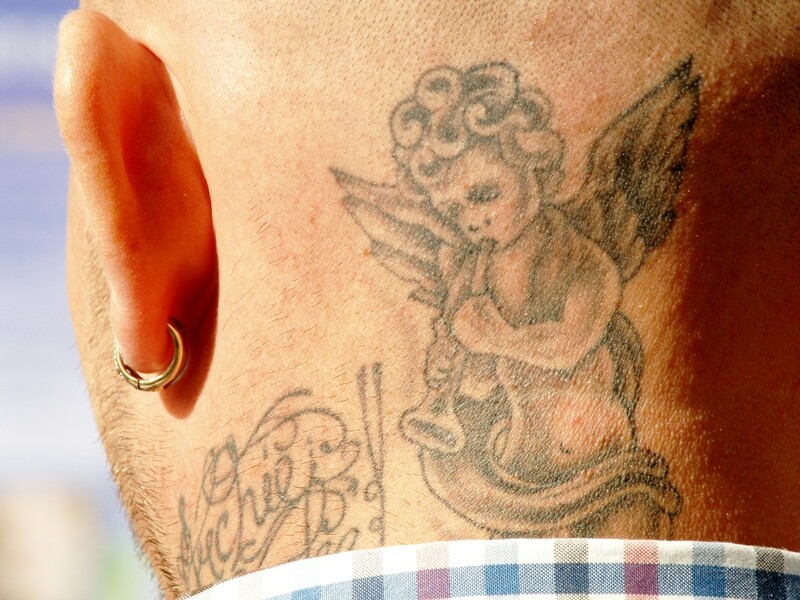 Neck: This area is the traditional place where a rosary would be worn. It also indicates that you want to keep Mary close to your heart. 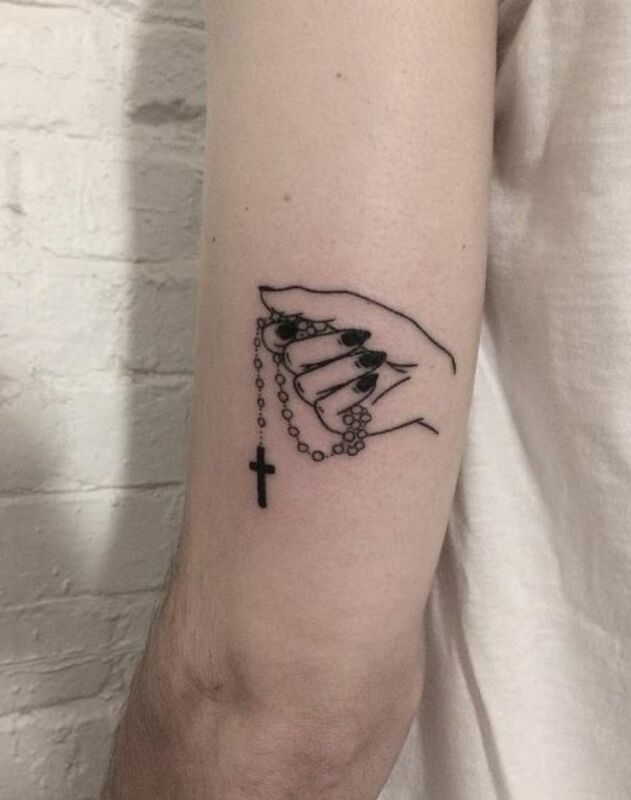 Wrist: Getting a single-decade rosary tattoo wrapped around your wrist is a very pretty choice. 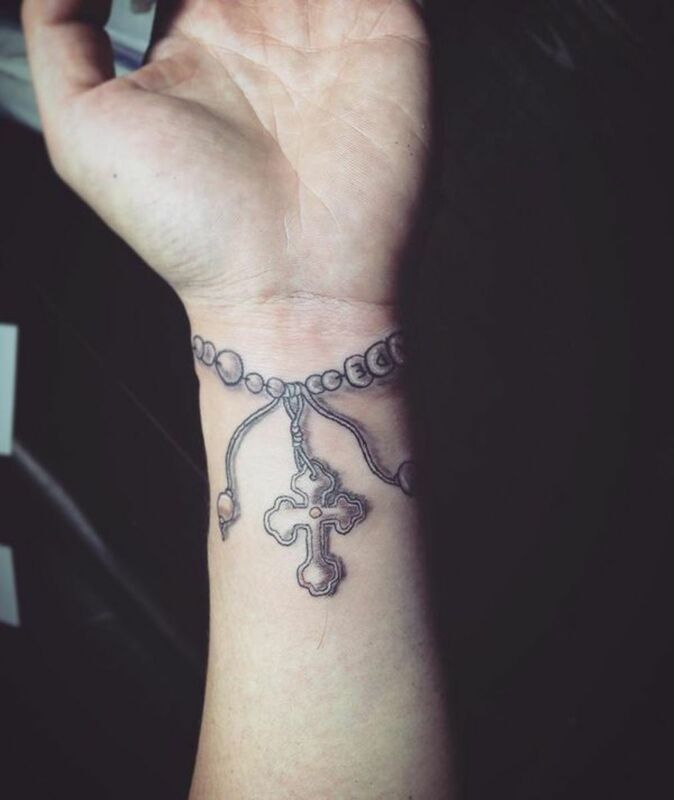 Anything on your wrist is a constant reminder, so a rosary on the wrist is a reminder that Mary is by your side. 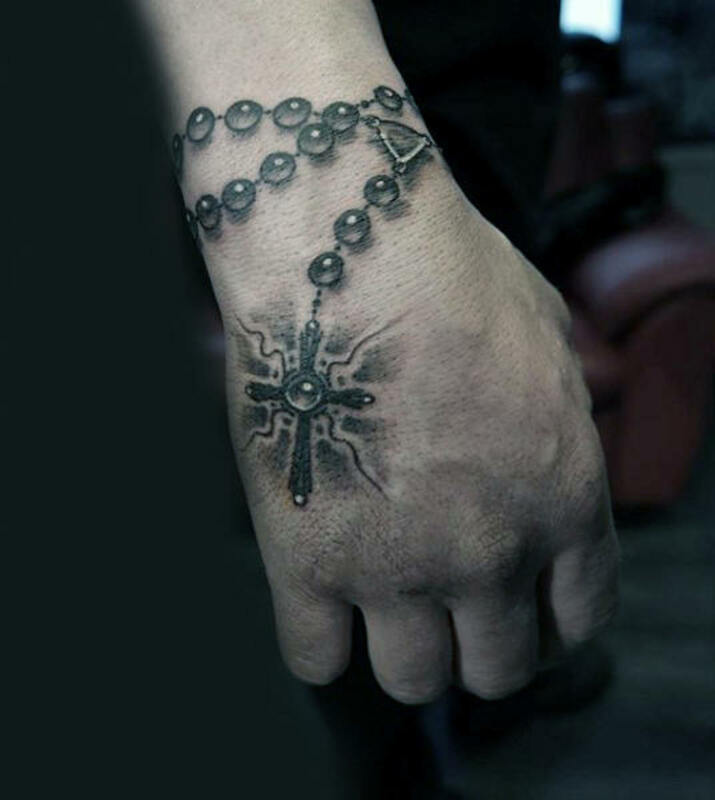 You can opt for a muted color like black or brown, or have the beads be different colors for this wrist tattoo. 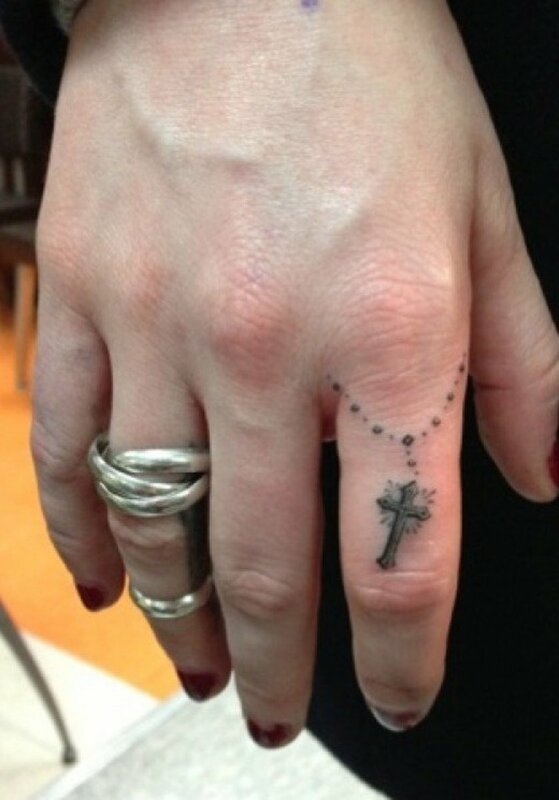 Finger: Fingers make choices, so a rosary around the finger guides your choices and helps you choose right from wrong. 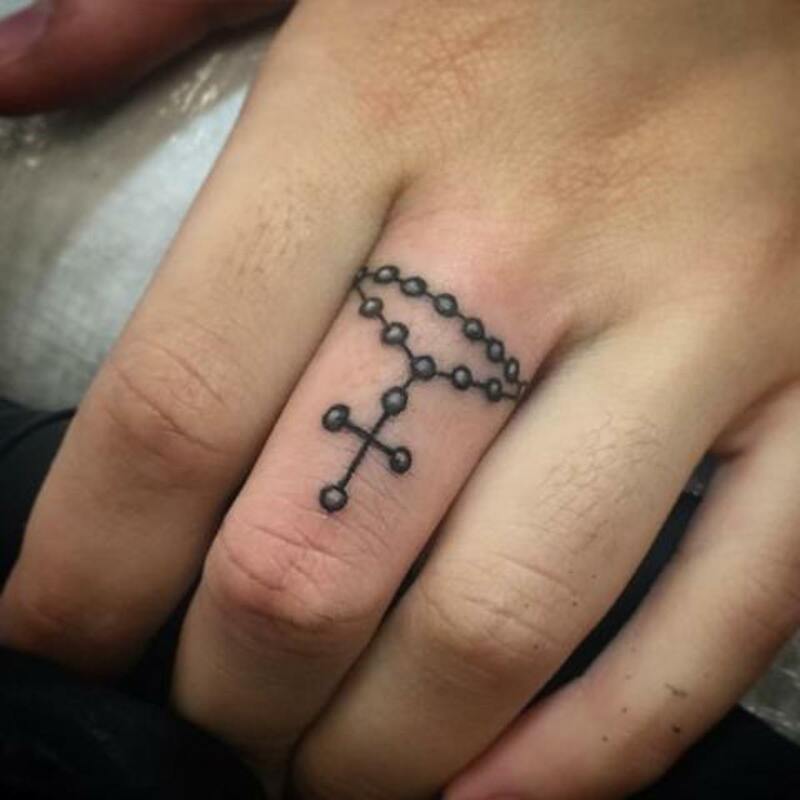 If you get it on your ring finger, it indicates that you are committed to your faith. 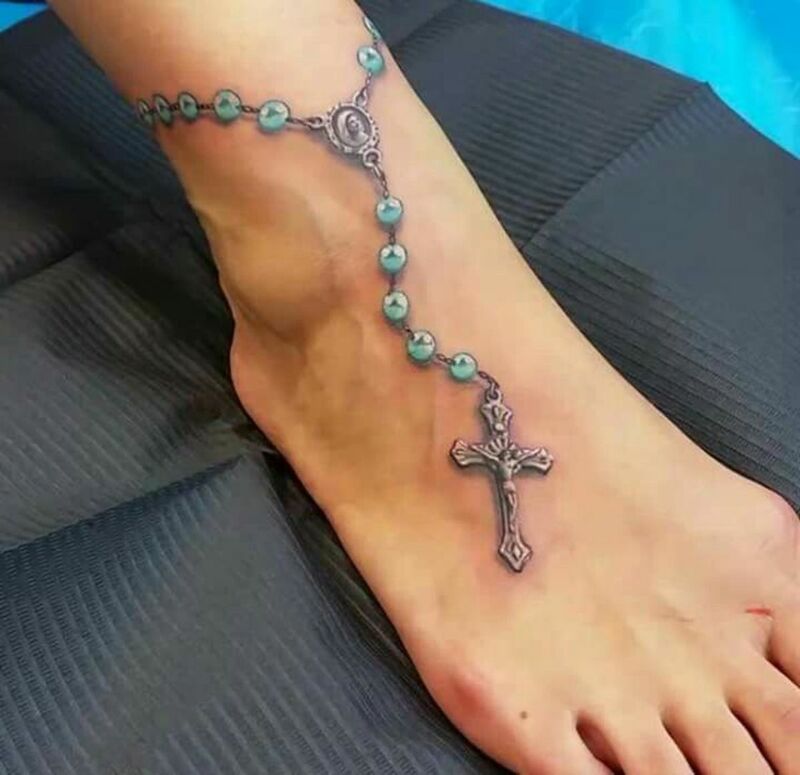 Foot or Ankle: The most popular tattoo for this area is the single-decade loop of beads wrapped around the ankles with the crucifix piece planted on the top of the foot. 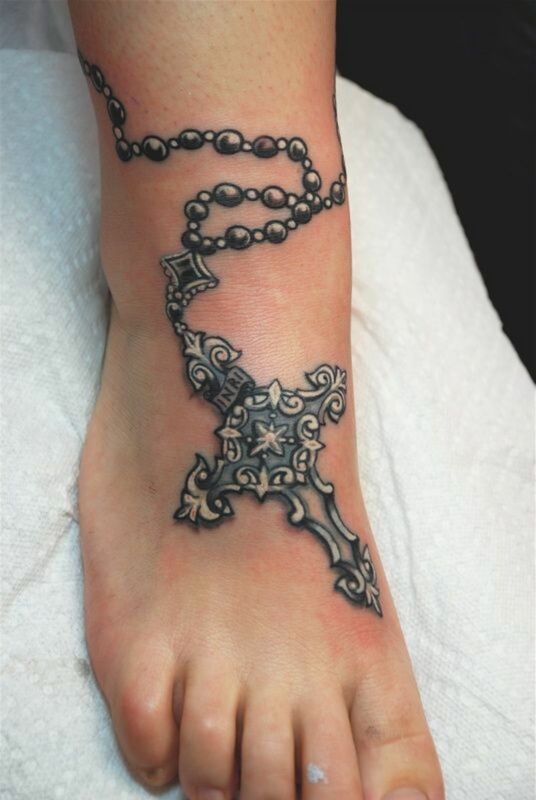 Getting an ankle rosary symbolizes Mary's role in guiding your steps and directing your paths. 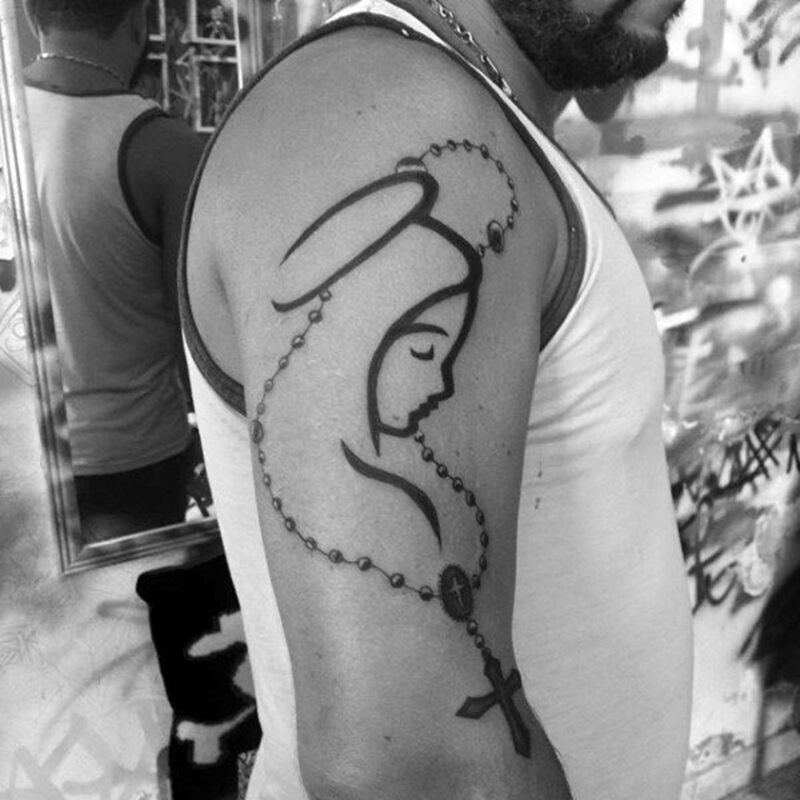 Back: Getting a rosary tattoo on you back is symbolic of protection because it signifies that Mary will watch your back. 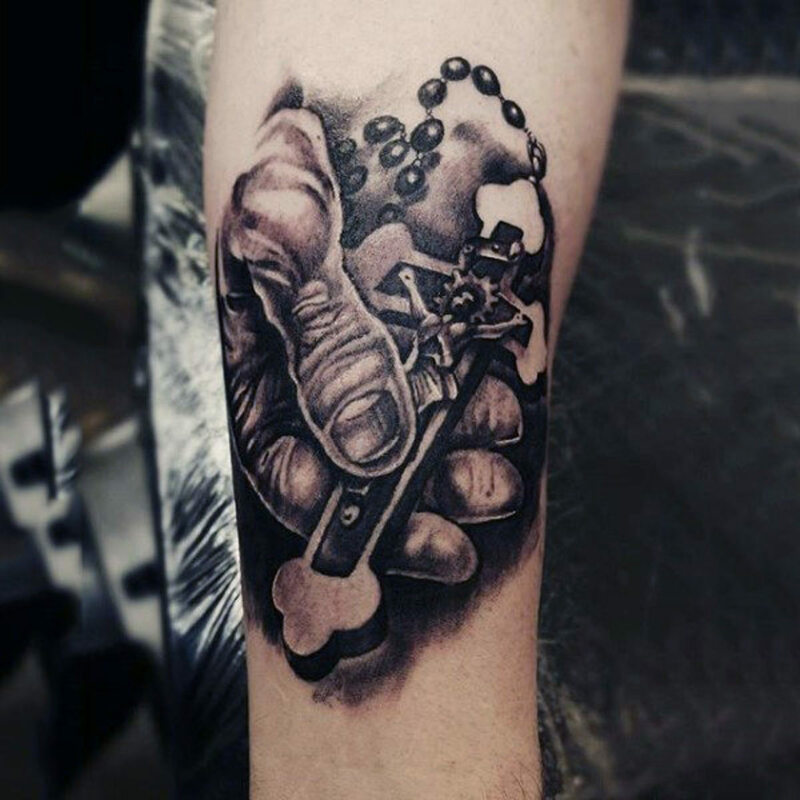 The Rosary Is Also a Gang Symbol? Yes! 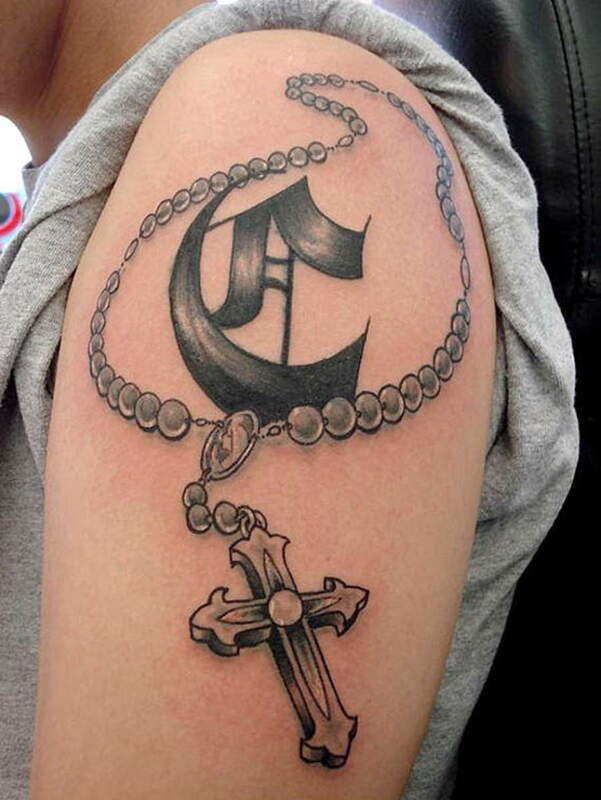 The religious rosary is a popular symbol among Latino gangs, specifically the Latin Kings and the Sureños. A lot of people of Latino or Hispanic heritage have Catholic backgrounds, and the rosary may be more so a symbol of their culture rather than their spirituality or religious faith, although sometimes it may represent both religion and culture. 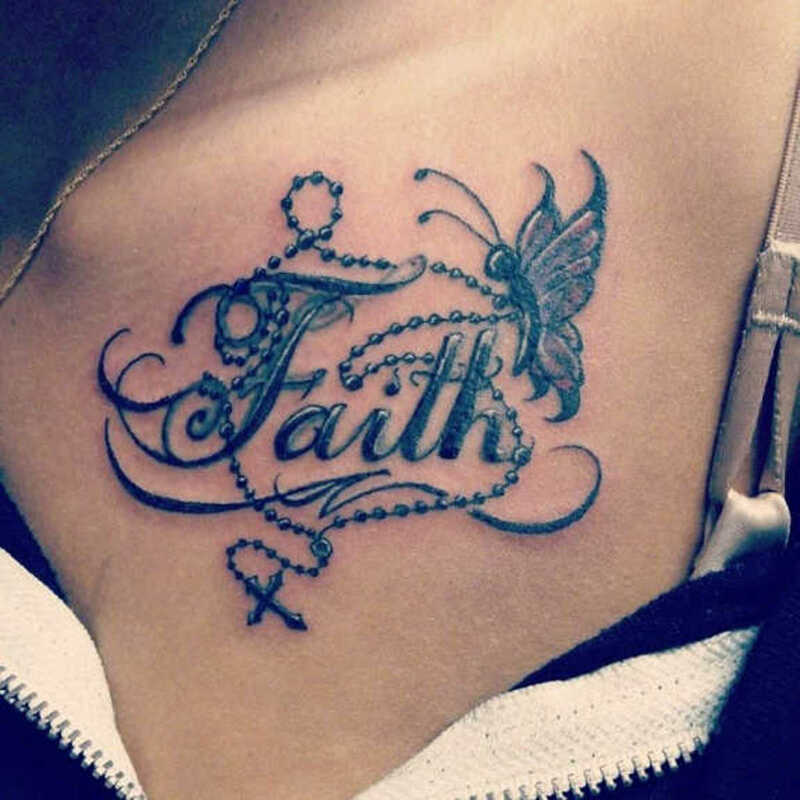 There are some important things that you should remember before you get this tattoo. The rosary is considered a sacred symbol. 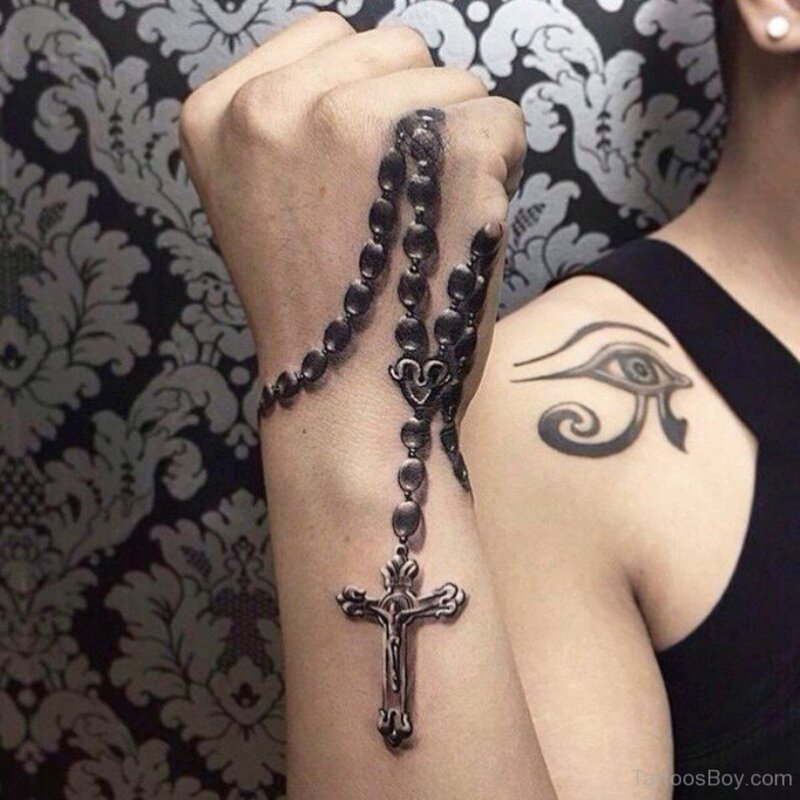 Certain religious people may find your rosary tattoo disrespectful. Be prepared for it. 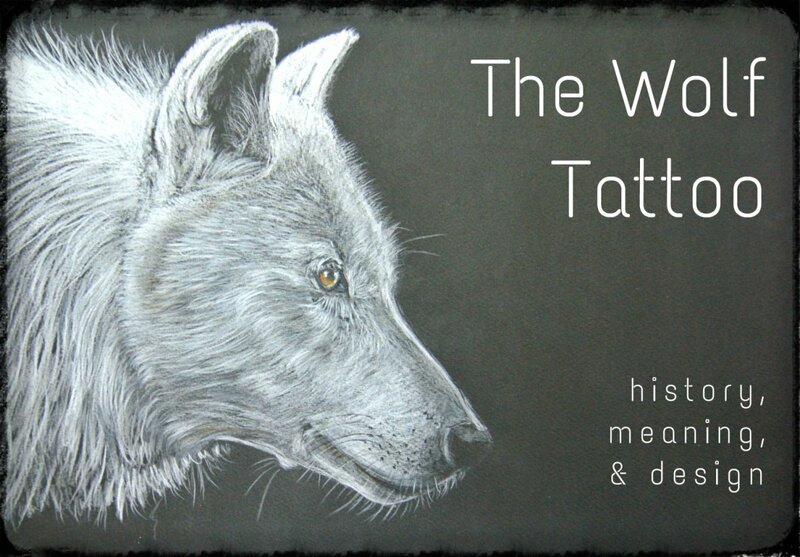 As with all tattoos, be sure to do your own research. 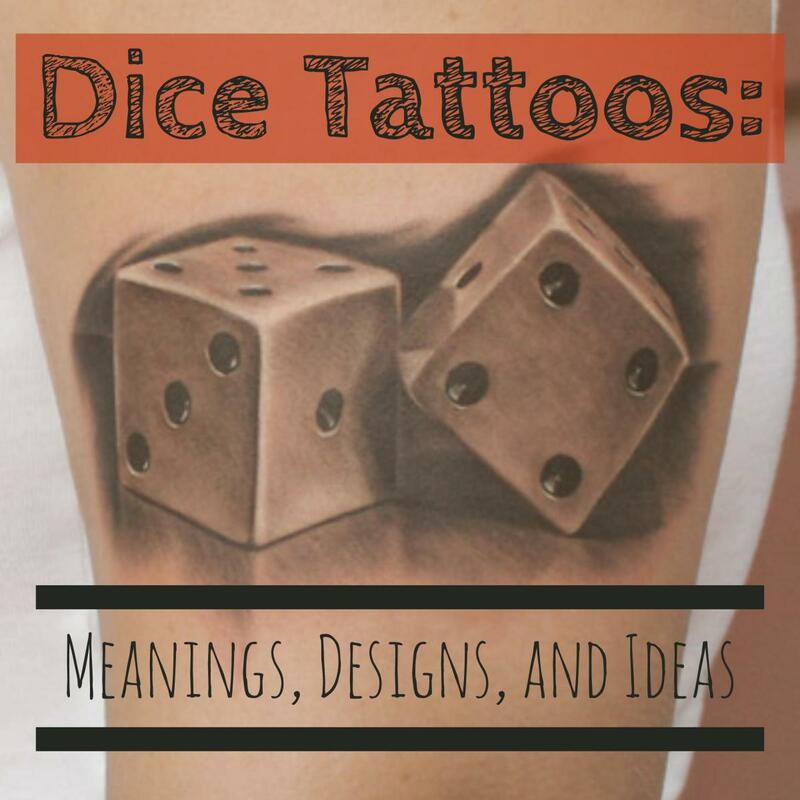 Make sure that you take the time to fully understand what your tattoo represents and stands for. Remember, you will wear it for the rest of your life. Don't rush to get inked! 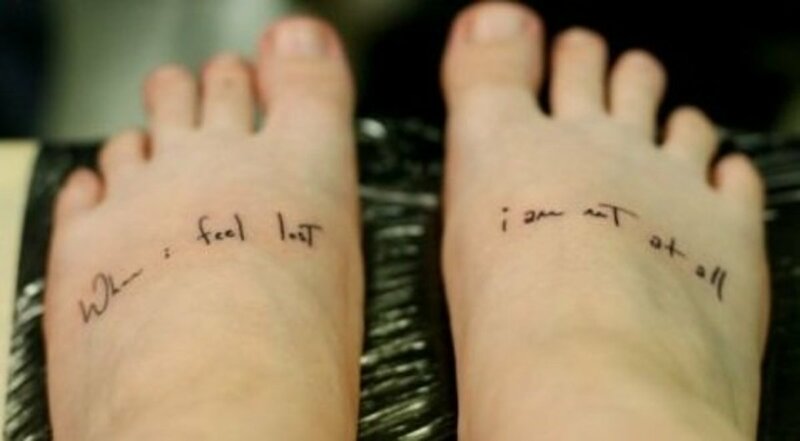 Never get a tattoo on an impulse. 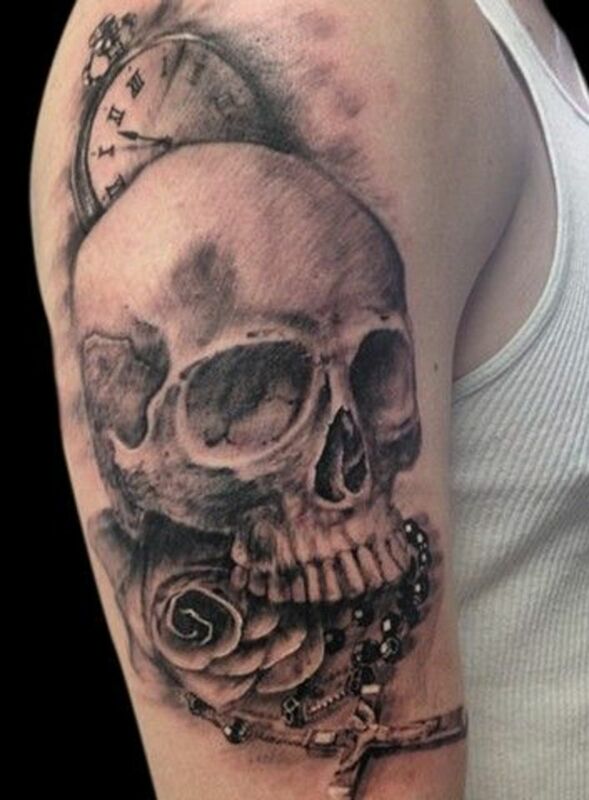 Men and women who rush to get inked usually have regrets later on down the road. You don't want this. Make sure you take your time, do your research, and choose a design that you know you will love forever. If your not sure, then wait until you are. 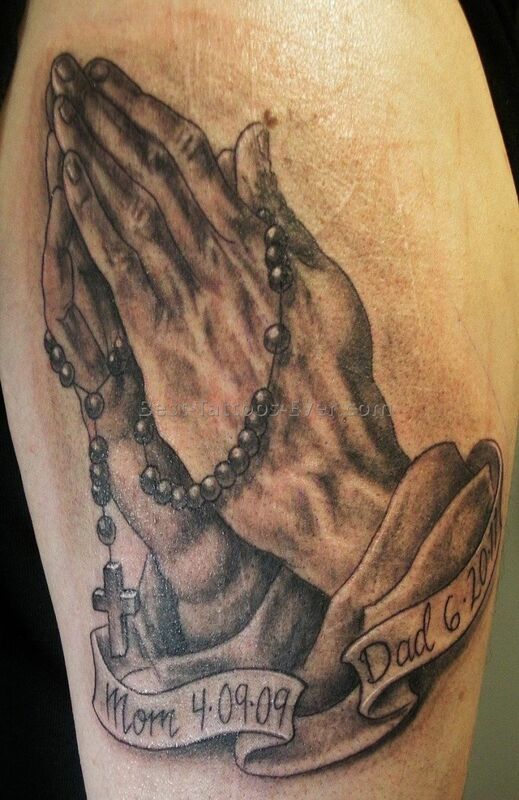 Make sure you take the time to view a variety of different tattoo designs before you make your decision. Look at ALL the options available. 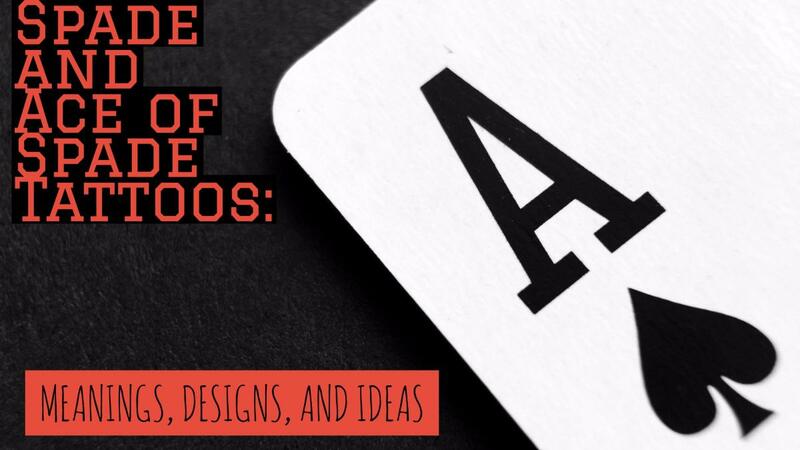 This will also help give you ideas and a little inspiration in case you want to design your own. In the end, just make sure it is what you want. Make damn good and sure you know all the means to having it there,as if you have the wrong person see you with it and it's just something cool you want could cost you your life!!! You can look all over the web but you will not find info on it and if you do find anything you may not even know it. So good luck and God seed!!!! Gypsy, appreciate the visit and encouragement. Glad you liked them dear friend. Have a good one. 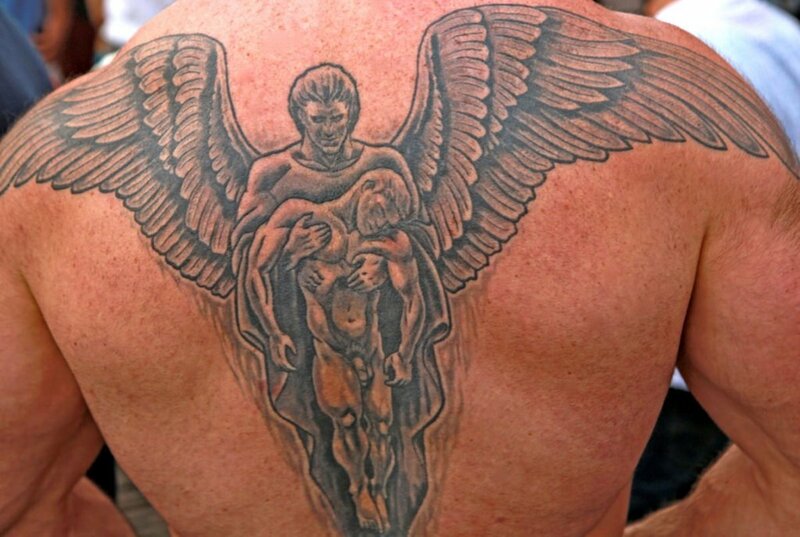 Amazing tattoos. Another great job Ricky. Thanks for all your comments. 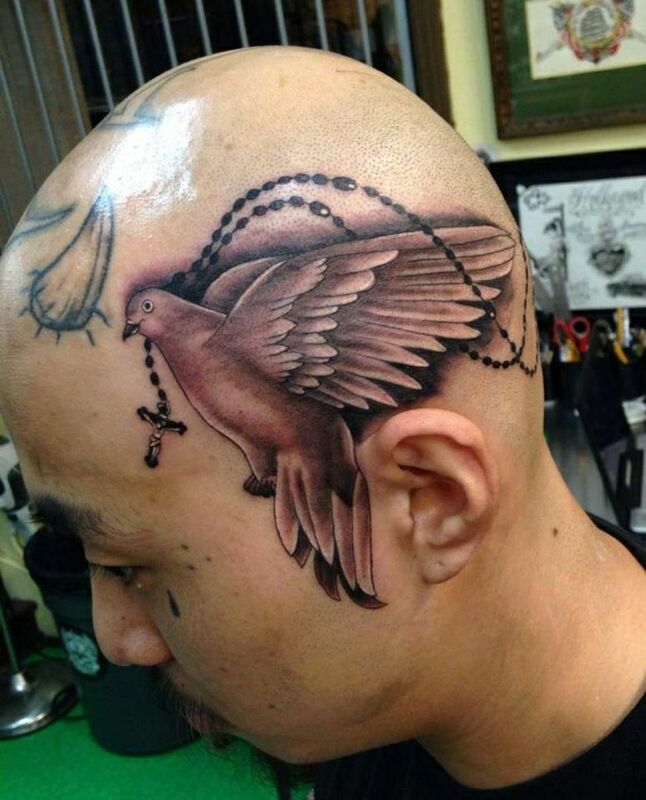 For some, tattoos are painful. For others, it barely hurts. Just depends on the type of person you are. Thanks for your time and comments all. Take care. 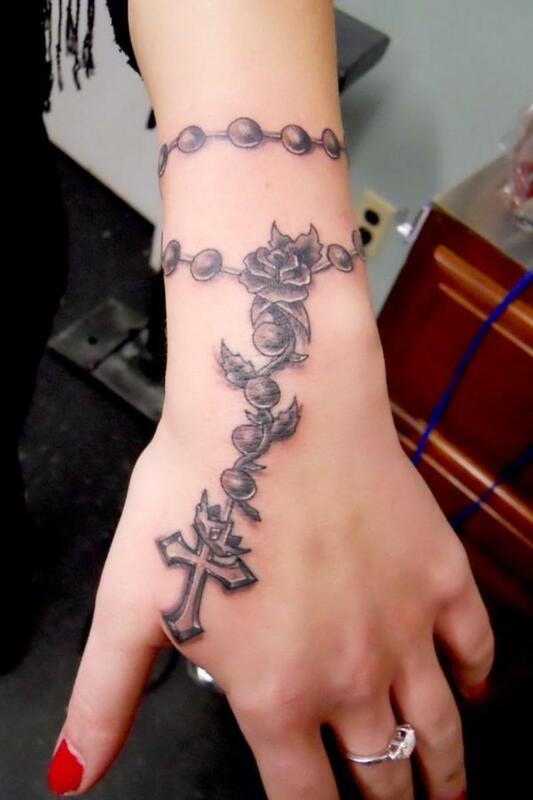 Hi my friend, very beautiful and awesome tattoos, loved all the beautiful photos has well ! Well done ! Wow, it always stuns me how detailed most of them are! 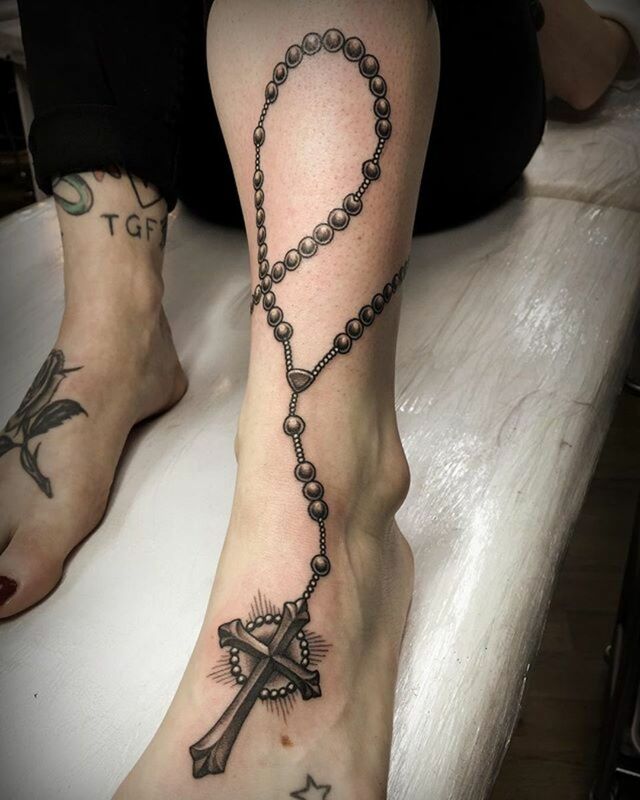 The rosary tattoo is very beautiful and unique. It must be painful right? Voted up nice.